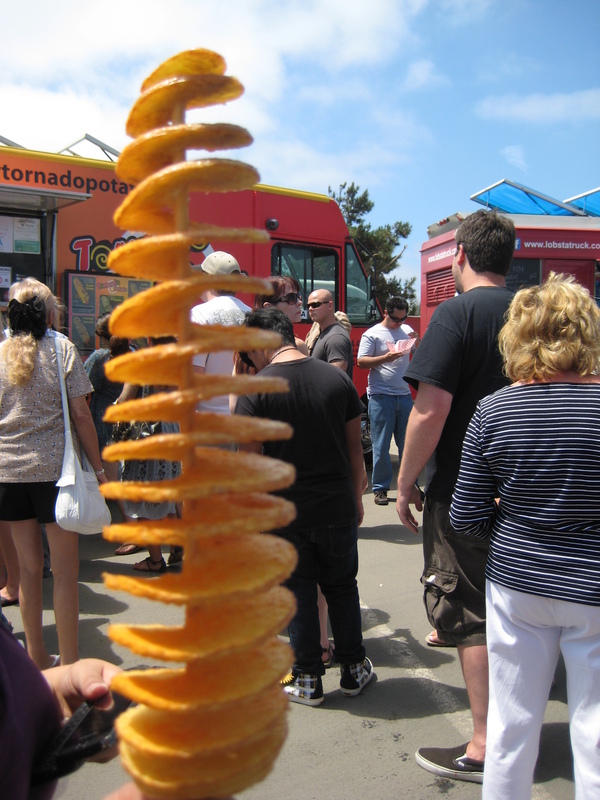 Last month was San Diego’s 2011 semi-annual Restaurant Week. For those who aren’t familiar with Restaurant Week, here is the quick break down: for a week, restaurants all over San Diego county have 3-course (sometimes optional 4th course) prix fixe menu showcasing at times the restaurant’s best-sellers and/or customer favorites for dinner. 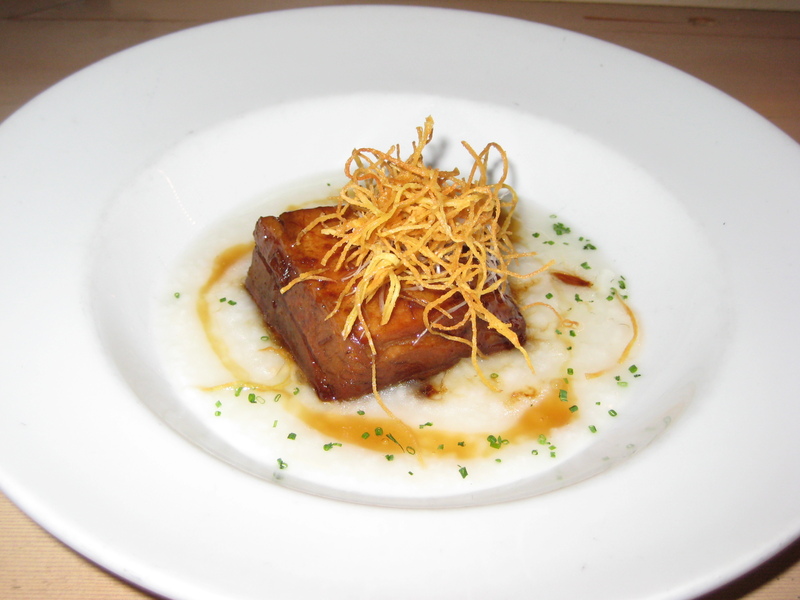 However, this year’s fall round of RW included lunch prix fixe menus of 2-course options at certain restaurants! Some restaurants will also extend to a second week, but they don’t usually announce that on the website til the day before. For those wanting to dine at the 5-star restaurants, but don’t have the pocket change to spar, this is a great way to get the full experience of the restaurant at a discount! This time, I made it a mission to hit up at least one restaurant…and ended up going to TWO restaurants with CP. Granted, it does get expensive if you’re going to more than one restaurant, but reading ahead of the menu choices and you could be walking away with a steal. 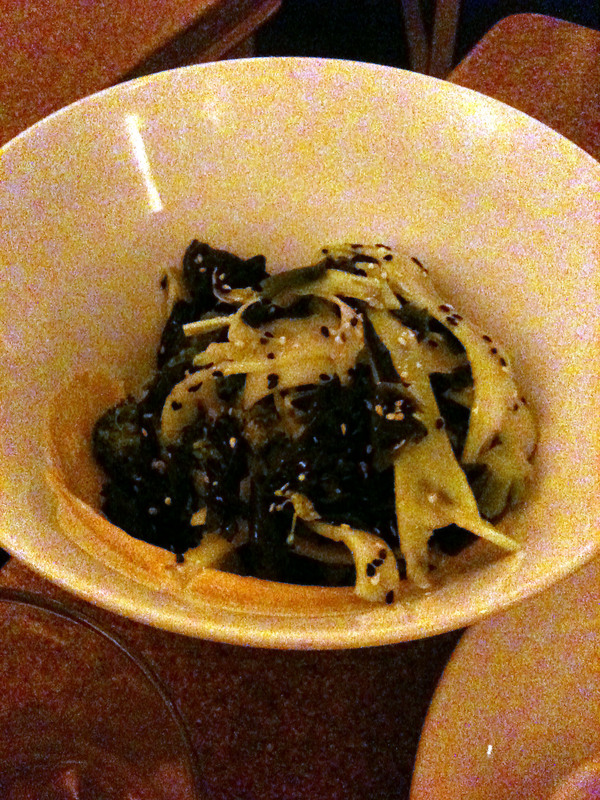 Our first restaurant of the week was a restaurant CP and I had already visited before, but I love – Whisknladle. The best part of their menu during RW was: their ENTIRE menu was part of the event. You could select any appetizers for your 1st course, any entree for your 2nd, and any dessert as your closer, all for $40. Now if this is not a deal…then I don’t know what is! 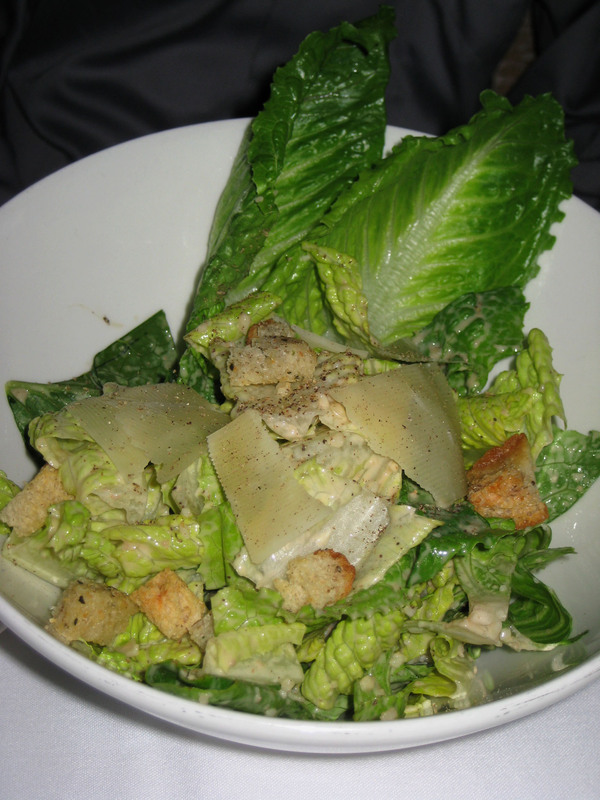 Caesar Salad – whole romaine lettuce dressed in “made-to-order” dressing (according to their menu), topped with shaved Parmigiano Reggiano and croutons. 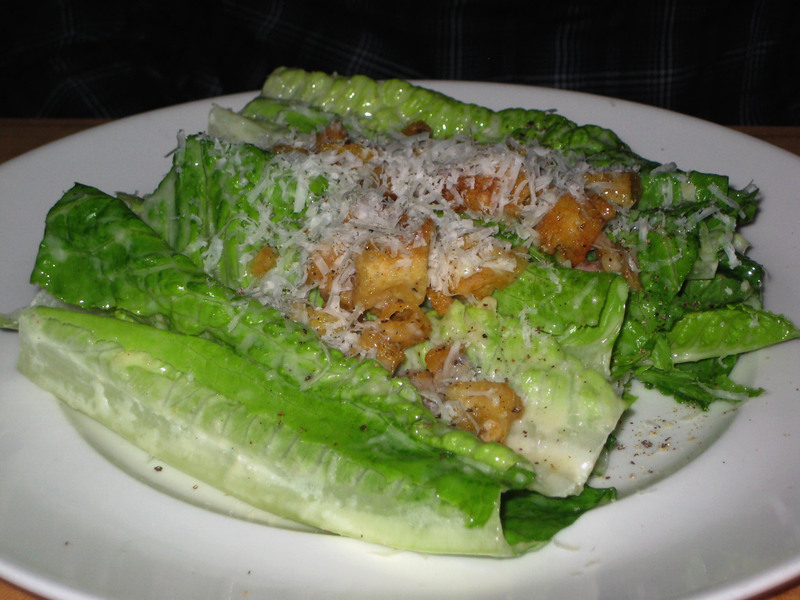 Nothing special, just a refreshing salad for CP and always a favorite for him. 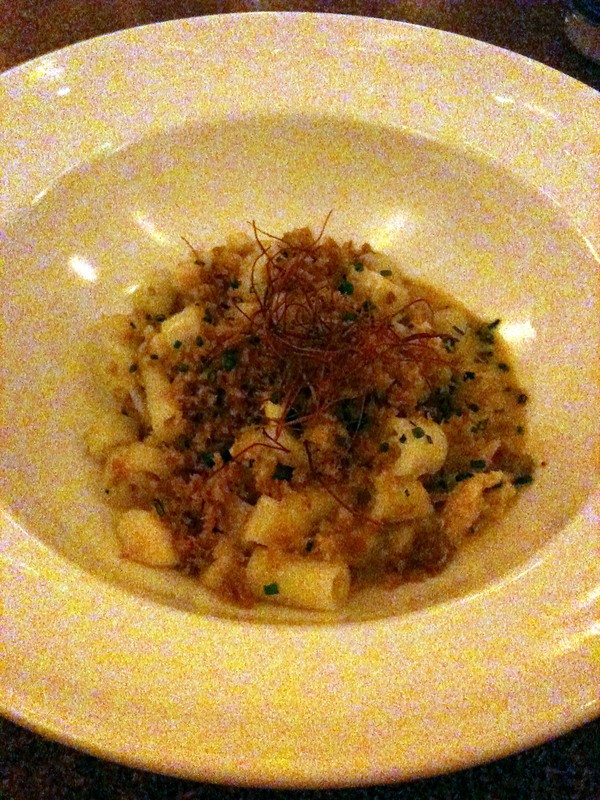 Potato Gnocchi in a brown butter-ale creme, finished with a gratinee of Brie de Meaux and chives. Luscious! 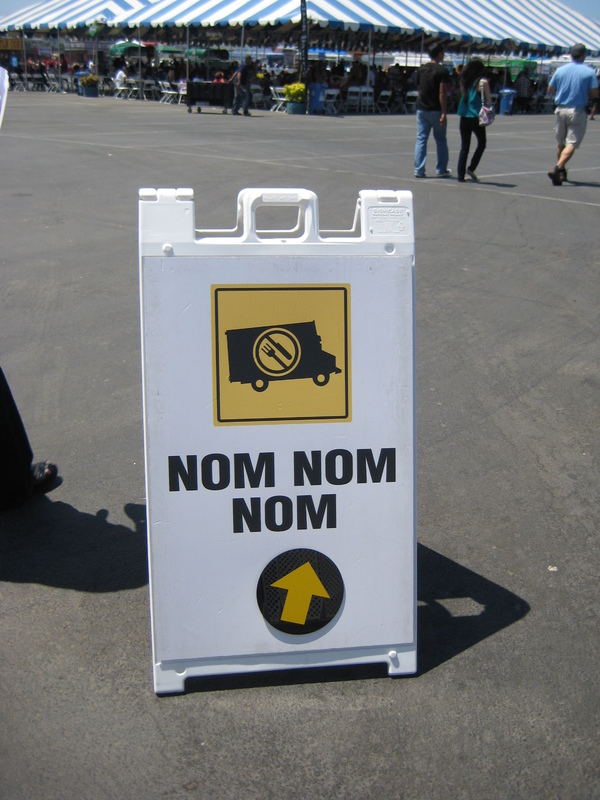 Wait…is that even an adjective to describe food?? Not sure, but that’s how this felt. The little potato pillows were just firm enough. with a little chew. to give you a bite, but somehow still remain light feeling. Then the rich, brown butter-ale creme that coated each and every single pillow was ridiculously rich and guilt ridden, but you couldn’t care. 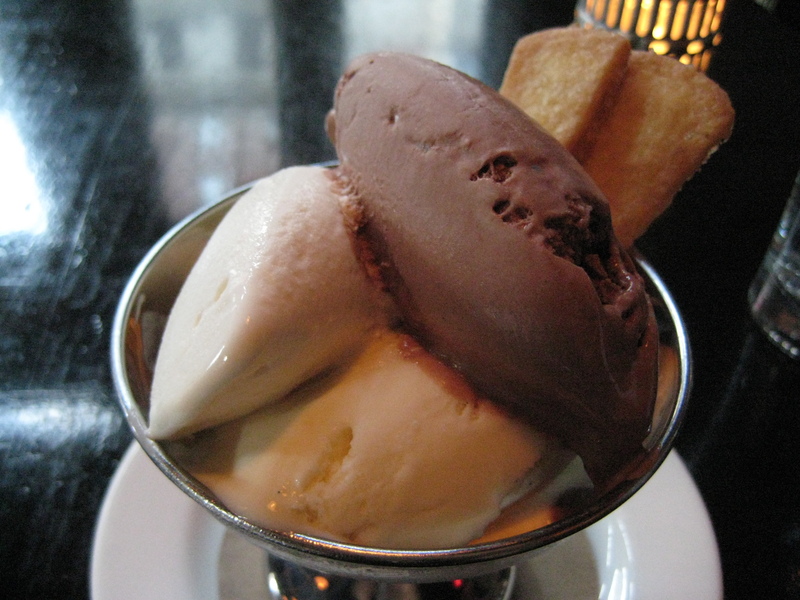 No, you couldn’t get over how smooth, a touch of sweetness, and creamy it felt in your mouth. Then that brie! Oh that brie…sweet, tangy, more oozing of creaminess. 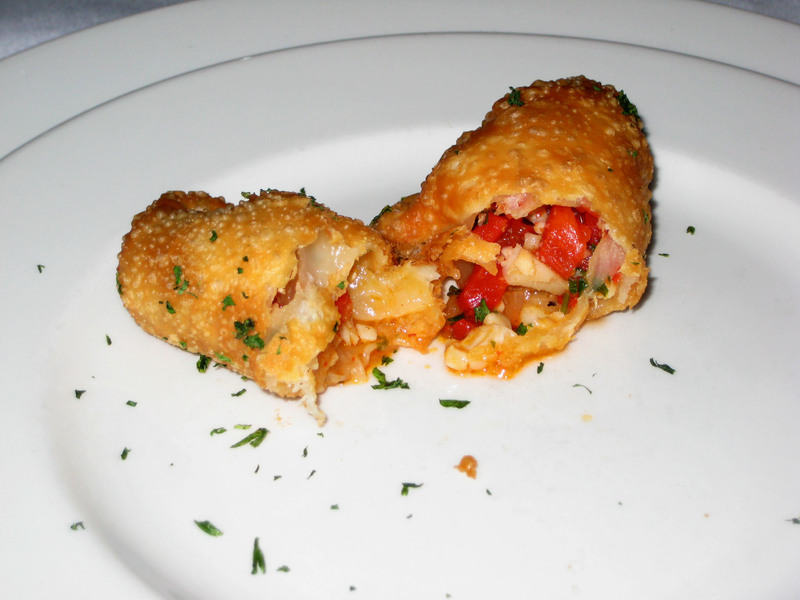 Man…this appetizer made me ‘oooh’ and ‘aaah’ as I devoured it. Needless to say that I enjoyed my appetizer very much! Seared Maine Scallops in a chilled green curry, roasted squash, tinkerbell peppers, spinach & capelin roe. What can I say? 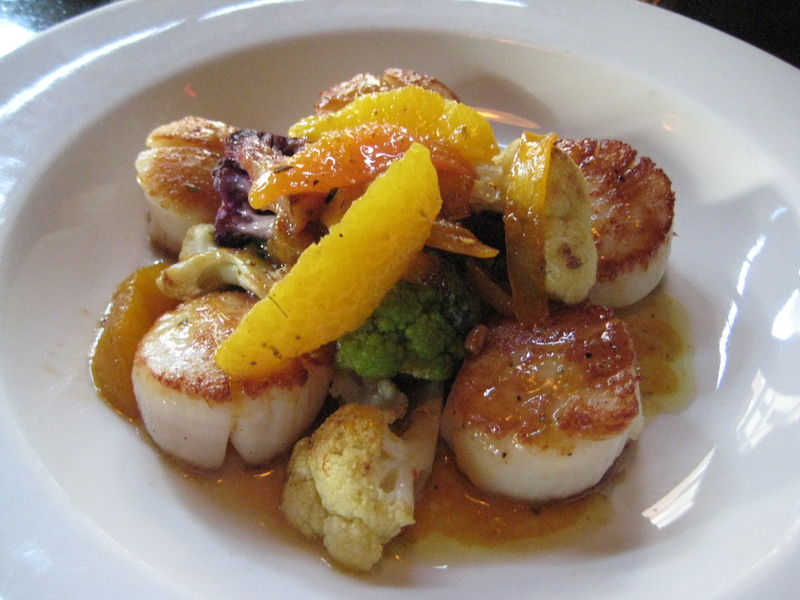 Can I ever escape ordering scallops when given the choice on the menu? Very, very rarely (if ever) would I pass up scallops. Whisknladle did not disappoint in preparing my favorite shellfish. Perfect sear to give the nice, crispy, caramelized crust, without overcooking (too many times that has happened to me). Sweet, salty, cripsy, soft, buttery, bitter (from the peppers), and light. Dark Chocolate Pots de Creme topped with a layer of salted caramel and served with roasted banana cake. 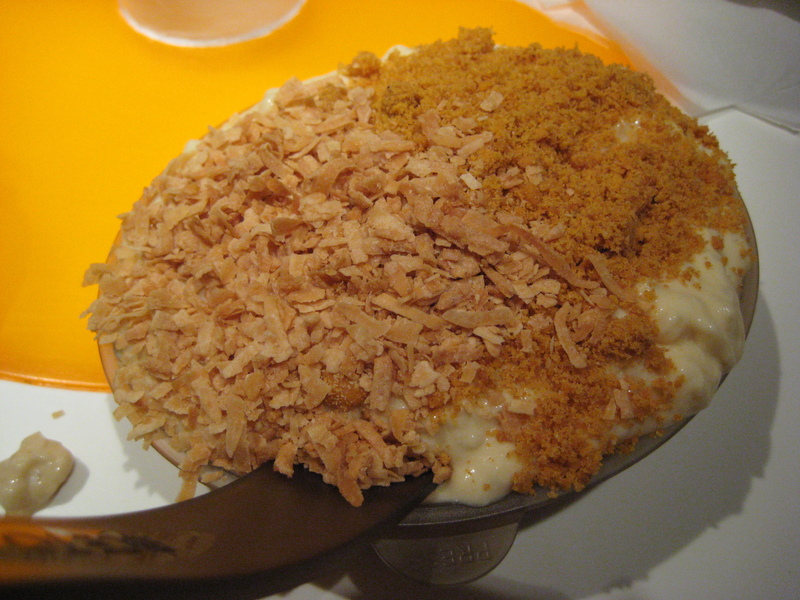 Ok this pots de creme was magical, but cloyingly sweet after your second or third spoonful. I suppose that’s why they had the banana cake, but I almost wanted something something salty on the side. However, I would have taken some ice cream to go with it, or whipped cream to just help break that sweetness. 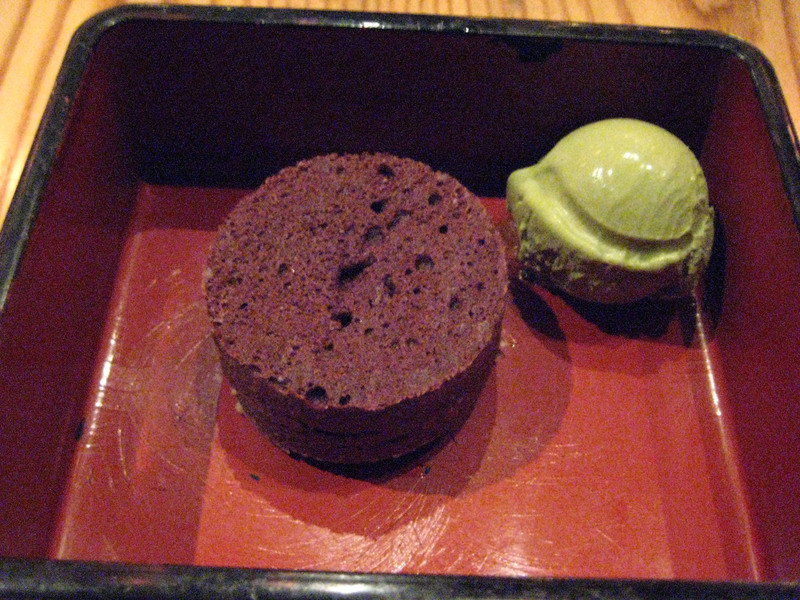 Still delicious, although it was the first time I had to leave a dessert unfinished (*GASP!*). Oh look! 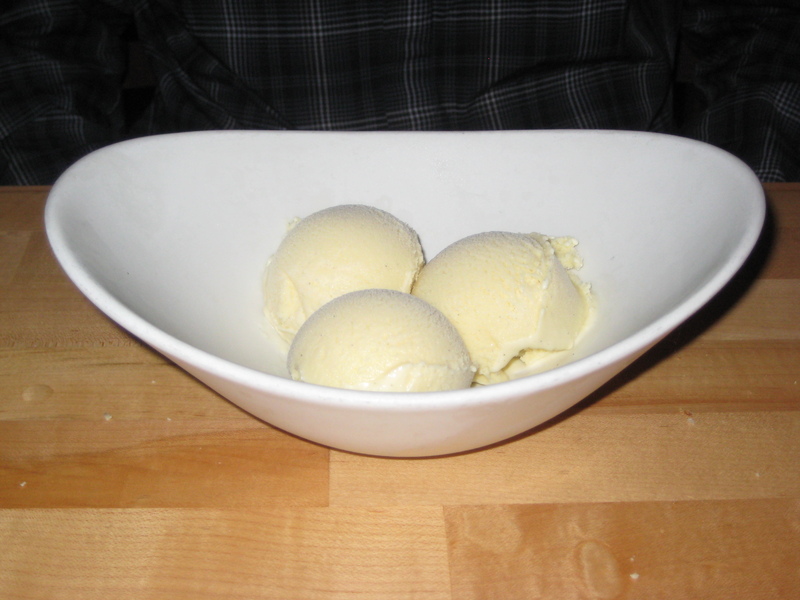 There’s the vanilla ice cream that I needed! Except this was CP’s dessert and even though I had a little bit (to go with my dessert), I didn’t want to take more. 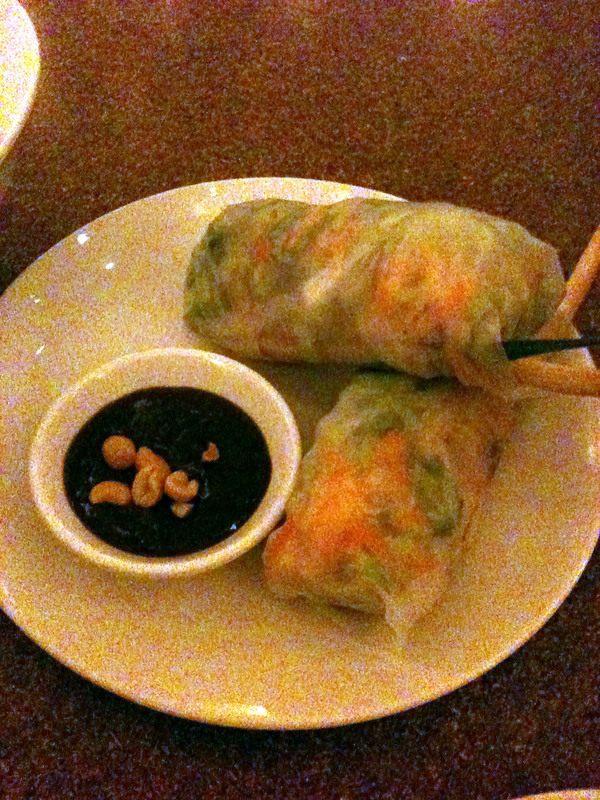 Our server was great – helpful, friendly, and attentive where needed. Again, Whisknladle remains on my top list! Now this is one restaurant I have never been to and had been in my “maybe” list of the Restaurant Week choices for several years. 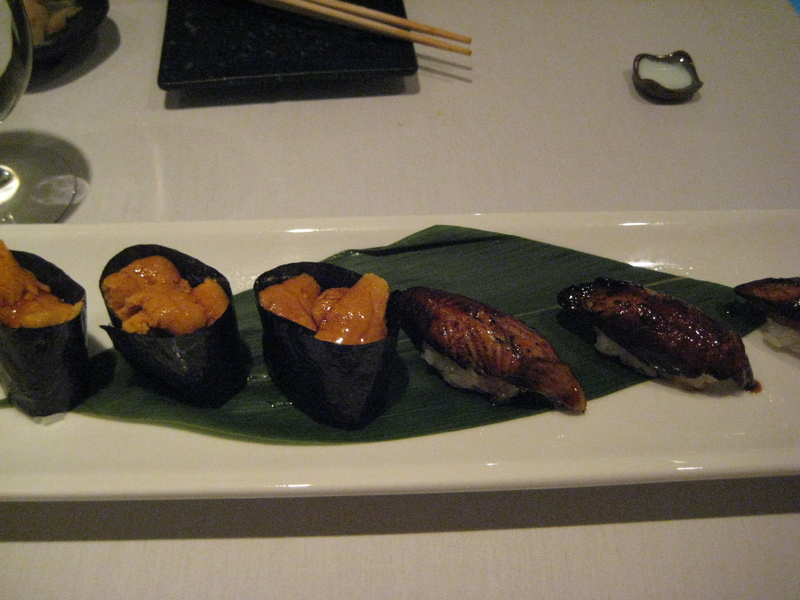 This time however, CP did not partake in the RW prix fixe menu since he did not find pairings that suited his taste. 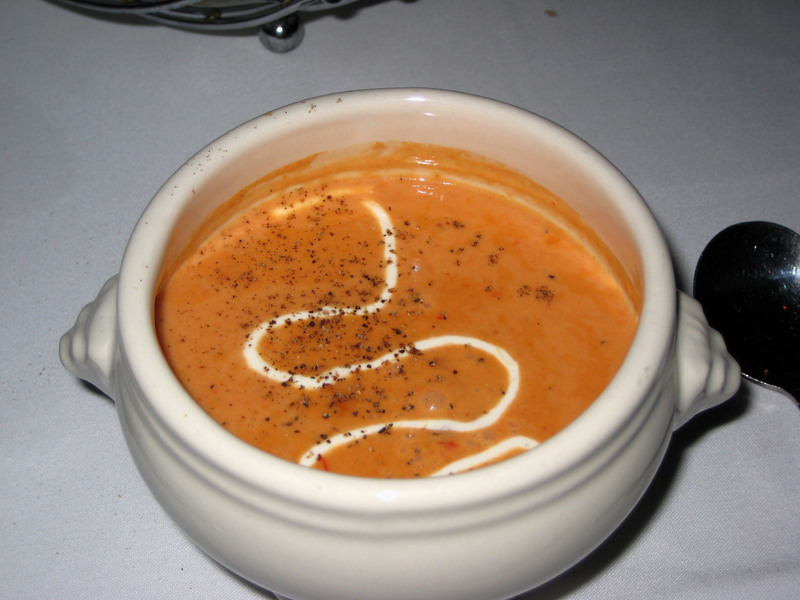 Crab Bisque – roasted red bell pepper broth, Meyer lemon crème fraiche. This was not mind blowing, but I did enjoy the bisque. I could have used some more crab, but the bisque was thick and rich, and citrus from that lemon crème fraiche did help enhance the flavors. 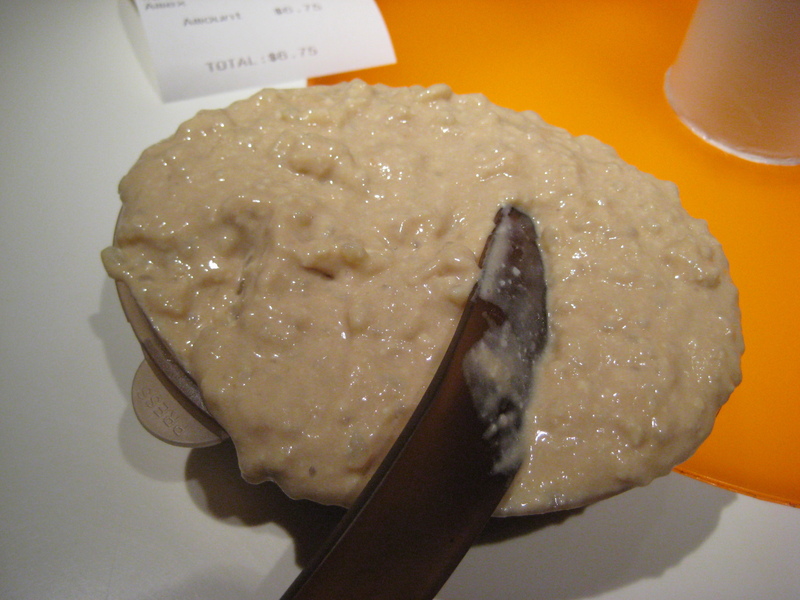 Although, I will say this bisque went great with the complementary foccaia they provide as part of the bread service. 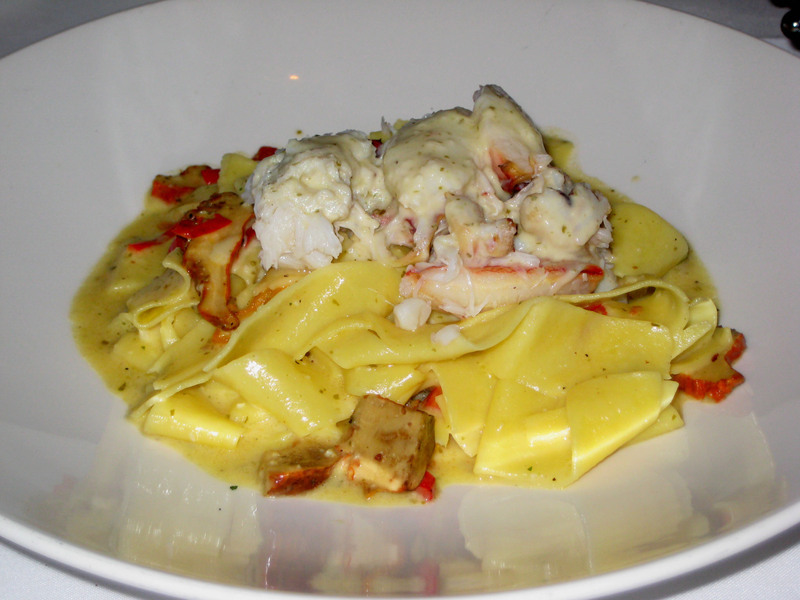 Dungeness Crab Pappardelle with sweet heirloom peppers and lobster mushrooms, in a creamy Thai basil garlic sauce. Man, oh man, where do I begin? Let me count the ways this was a fail for me: 1. Not nearly enough crab, 2. Pasta was cooked a little more than I like, and 3. This was the weakest sauce on pasta I have had in a REALLY long time. When I see “Thai basil garlic sauce”, I expected to get basil (I barely), garlic (not sure if there was any), and flavor – this was definitely NOT there. This pasta made me so sad. So very, very sad. The crab mound on top was the best part of this plate and I ate it all up. Everything else…I wanted to return. 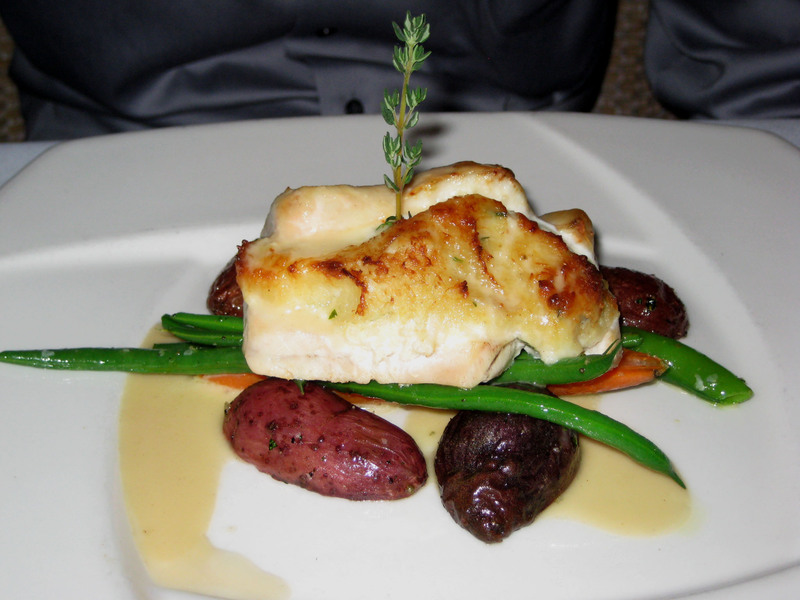 Sea Bass with Maryland lump crab stuffing, fingerling potato, Haricots Verts, with a lemon thyme mustard sauce. For once, I was seriously jealous of CP’s entree – I WANTED IT FOR MYSELF!!!!!!! The sea bass was tender, falls to the slightest pressure of the fork, and the perfect sear. 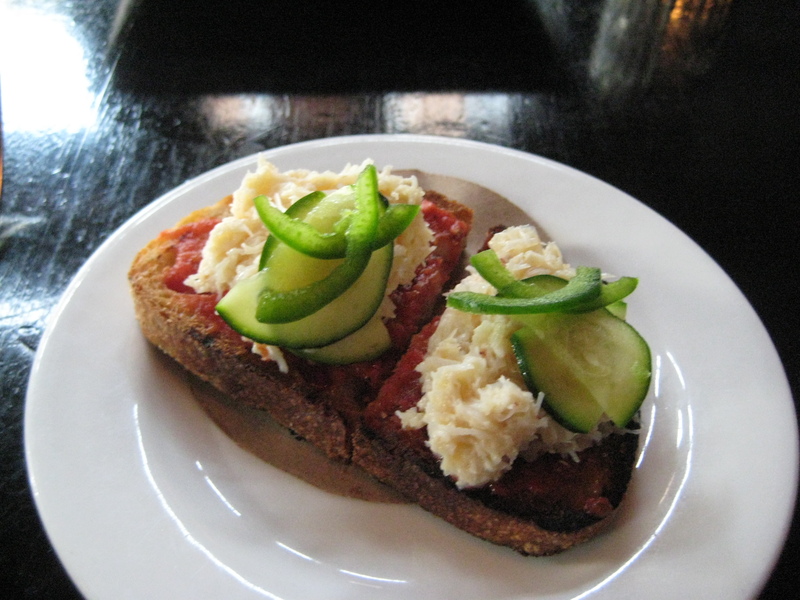 The crab added that extra natural sweetness, and I wanted it! *Sigh*…but next time, I’ll just order this one for myself! 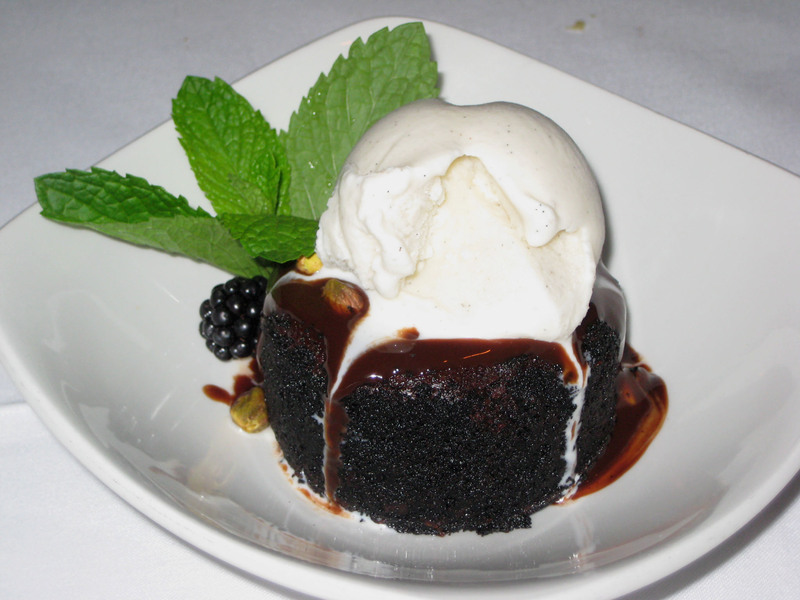 Warm Chocolate Torte with candied macadamia nuts and topped with Tahitian vanilla gelato. This dessert should come with a warning: “You are about to enter chocolate nirvana!” I think this torte has to be, hands down, one of the richest, chocolatey-est, dessert I’ve had in town. 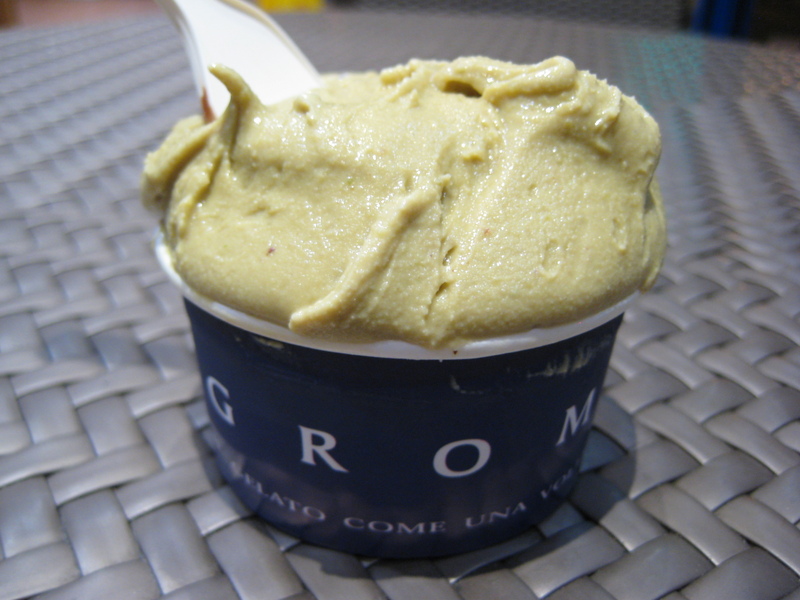 They got it right by giving you a giant mound of vanilla gelato because you DO need it. Also, in the center of the torte is a mountain of oozing, warm, lava pool of salted chocolate. 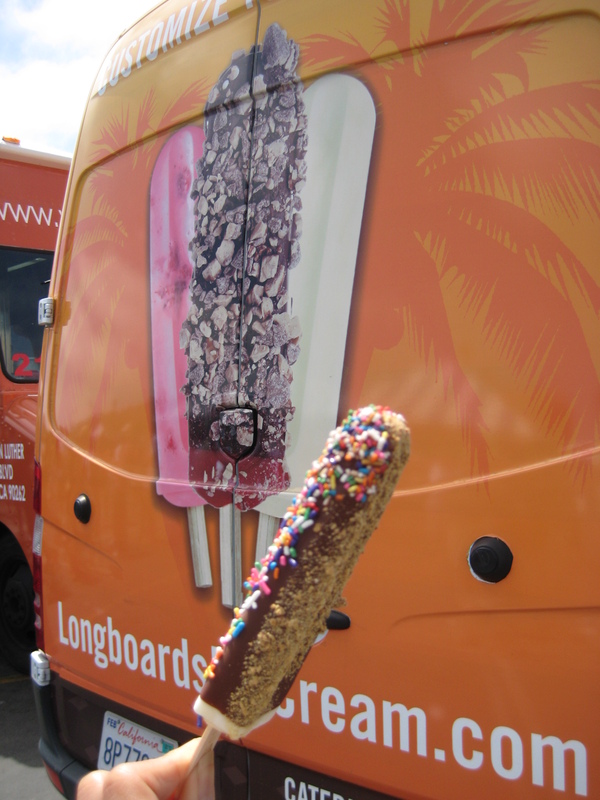 The only thing that could have made this better?…ANOTHER scoop of ice cream! I would come back for the sea bass and the torte. Those are a must! Everything else…I can live without it again. 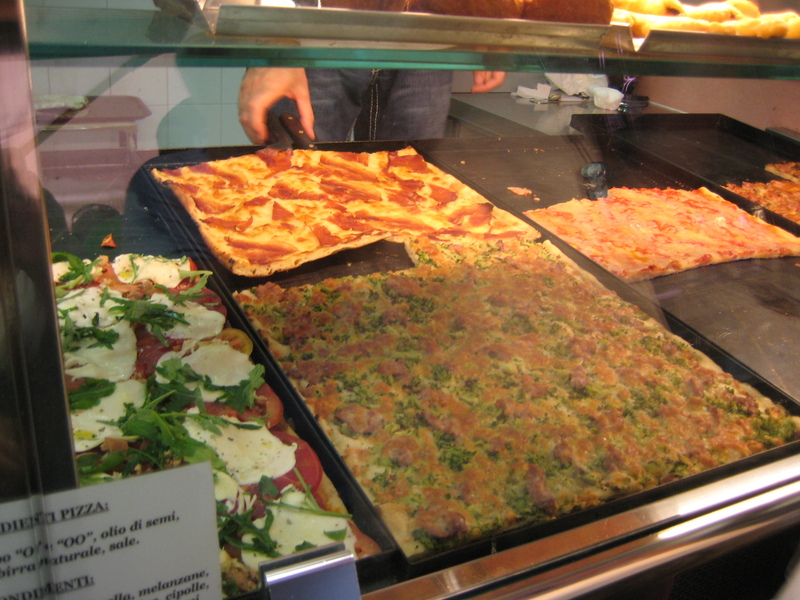 This was a little pizza vendor in a narrow corridor by the Pantheon. They have the a variety you can pick from and pay for it by its weight. Once you make your selection, the “nice” man will help heat it up in the oven for a little bit, before handing it to you on parchment paper. 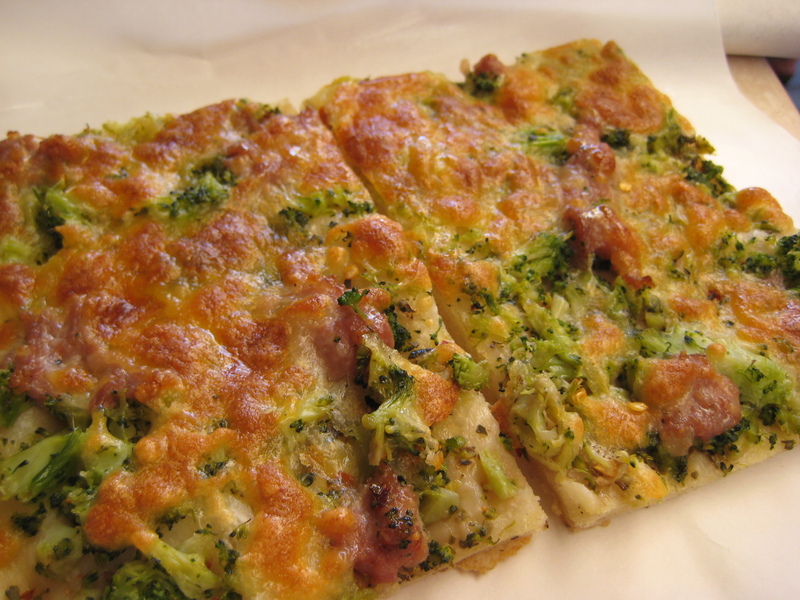 I helped myself to 2 types: prosciutto (top) and spicy sausage and broccoli (bottom). Ok, if you haven’t noticed already – neither type has tomato sauce and both have just enough cheese to hold everything together. The simplicity of the slices were amazing. 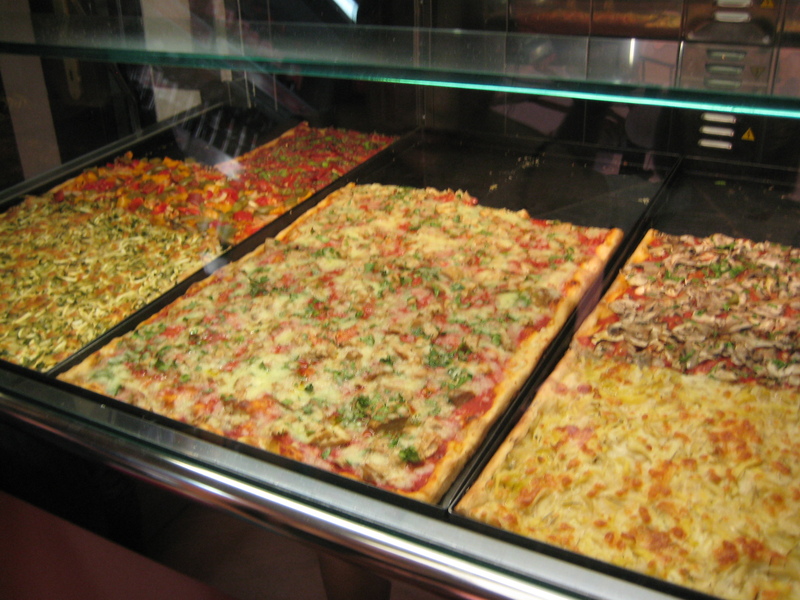 It tastes nothing like the pizza you know in the States (regardless of which ever style you eat). And of the two, hands down the spicy sausage with broccoli was the best. I love my food spicy and this baby had the right amount of kick without me needing to add my usual crushed red peppers. 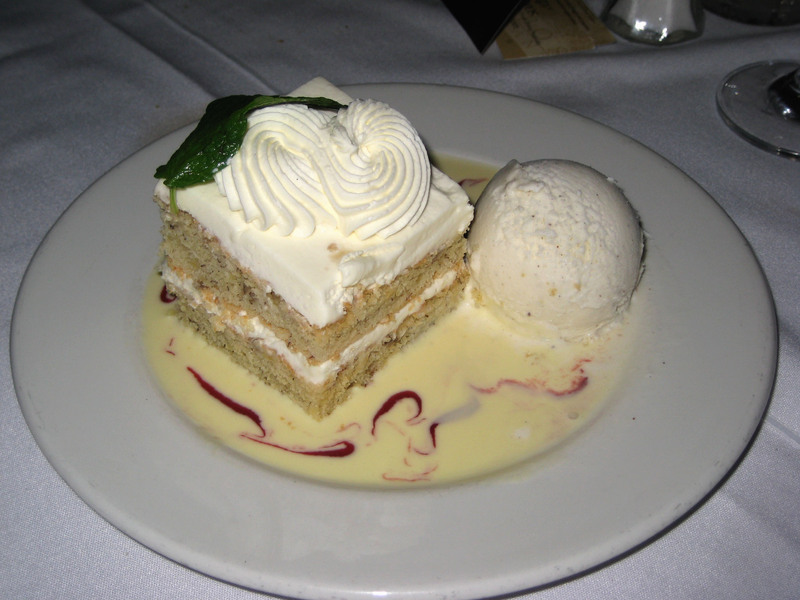 To date – I have yet to come across another slice that could mimic this taste. As many of you may have known, San Diego hosted it’s 7th Restaurant Week and this year, more than half of the participating restaurants extended their RW into the following week. 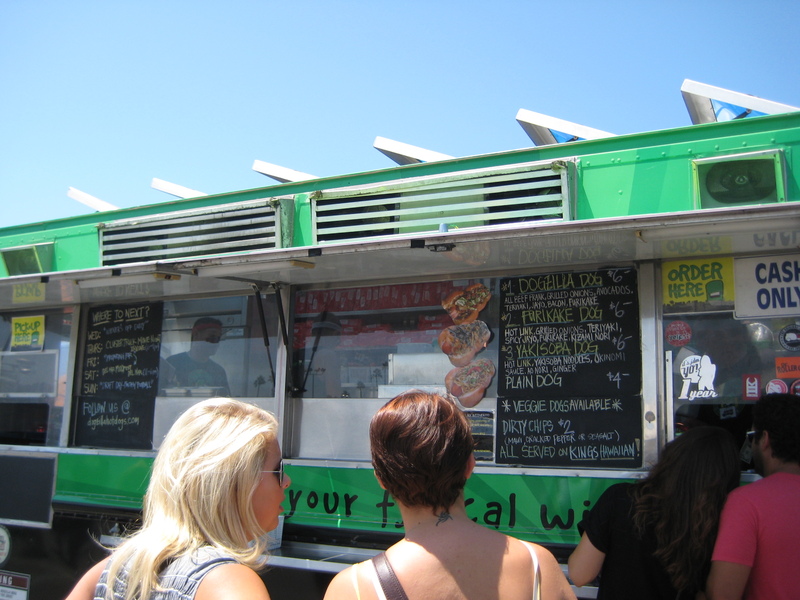 This gave restaurants more opportunities to introduce themselves to new audiences and thus, creating a bigger fan base. Some may like RW, while others do not and I think (which I have felt myself as well) it is due to the fact that for regulars, their restaurants are suddenly overtaken by new customers who ware clamoring for the pre-fix menu. 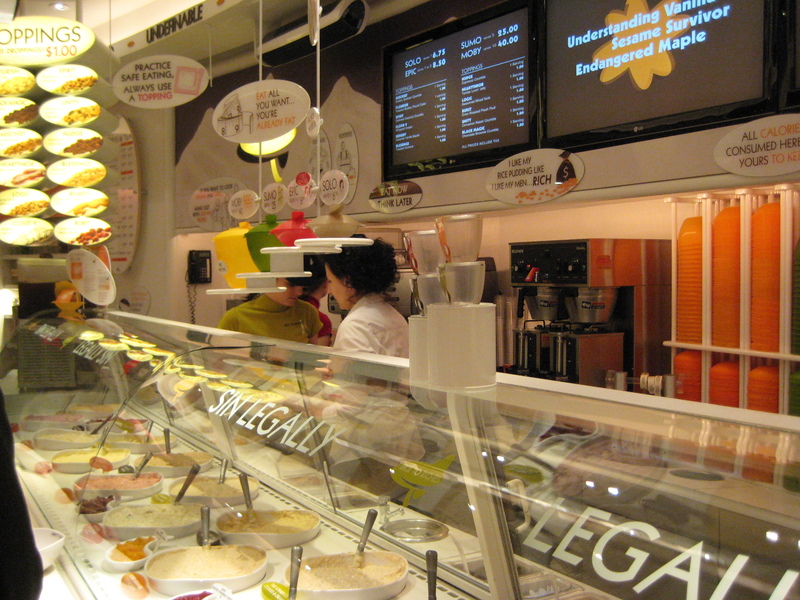 What you have to realize is this kind of exposure for restaurants is a great way to build up their client base. We must not be selfish because we all want our favorite restaurants to survive one of the toughest and cut throat industries. I participated in 2 RW menus for restaurants I had been wanting to visit for the longest time: Nobu San Diego and Cucina Urbana. 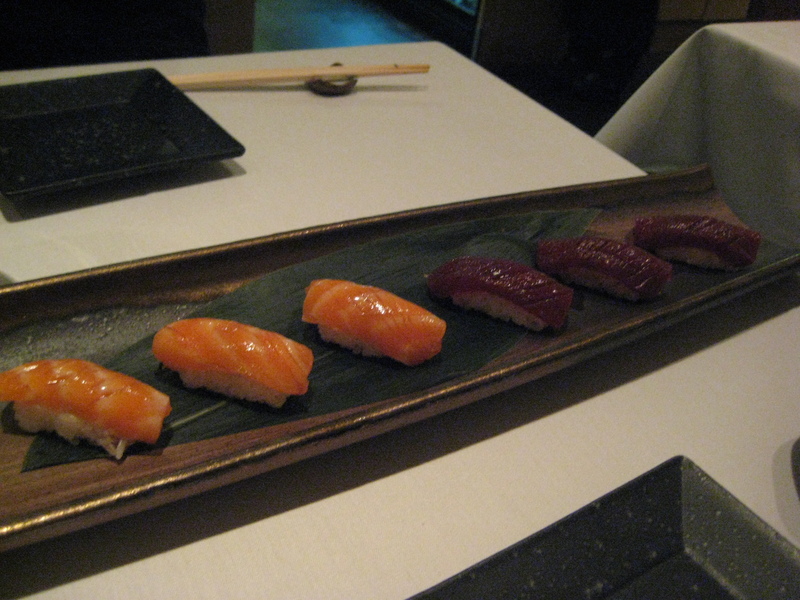 Both restaurants are very different in nature, but both were exquisite in food and service. 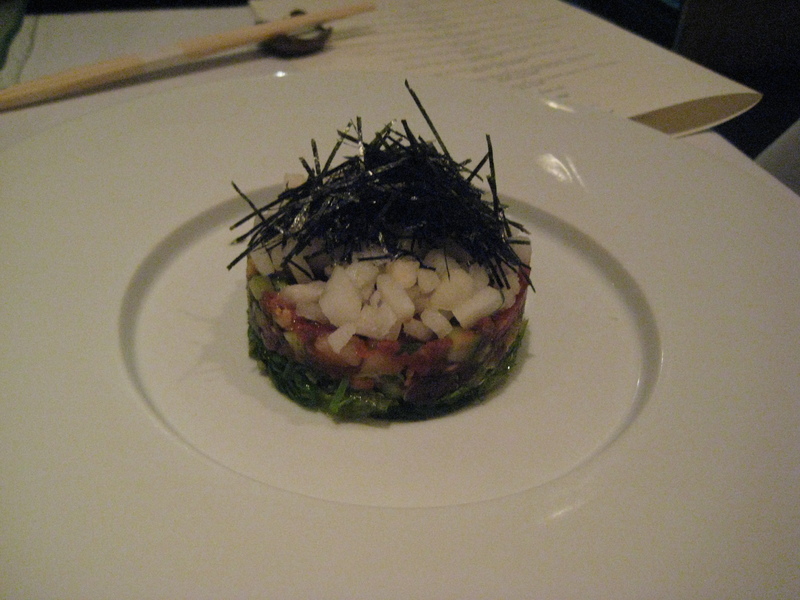 There is a reason why Nobu is so highly regarded and why locals cannot get enough of Cucina Urbana. 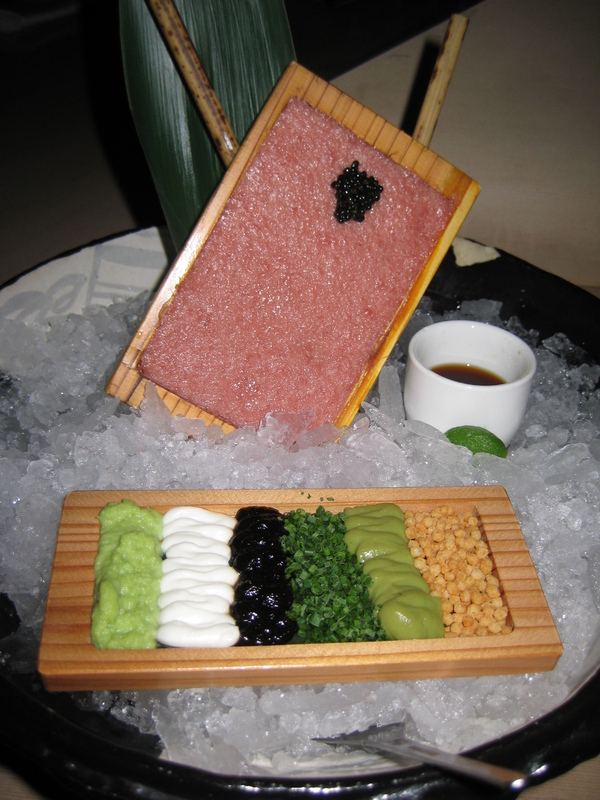 Nobu is sleek, chic, and hip. 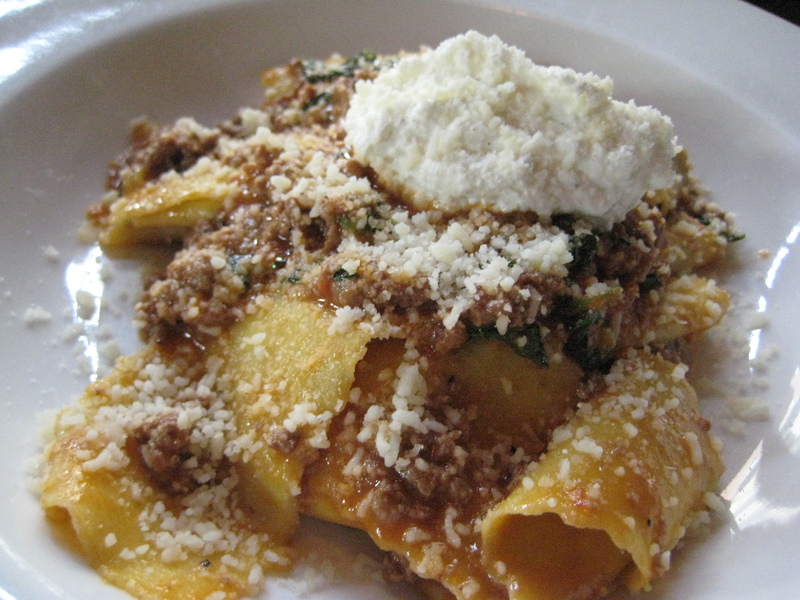 Cucina Urbana is rustic, homey, and modern. Either one can do no wrong and lived up to what I had expected when I stepped foot in each. The appetizer to start the night off was the Salmon Tataki Salad. 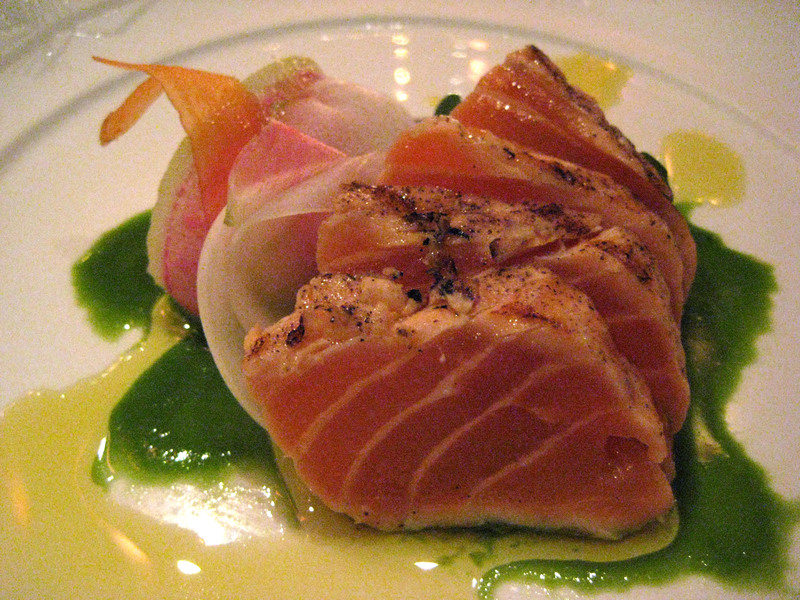 Lightly seared salmon sashimi was accompanied by shaved root vegetables, with cilantro dressing. Usually I am not a big fan of seared sashimi because I think it takes away from the beauty of the fish, but in this case, I found the sear to be perfect. 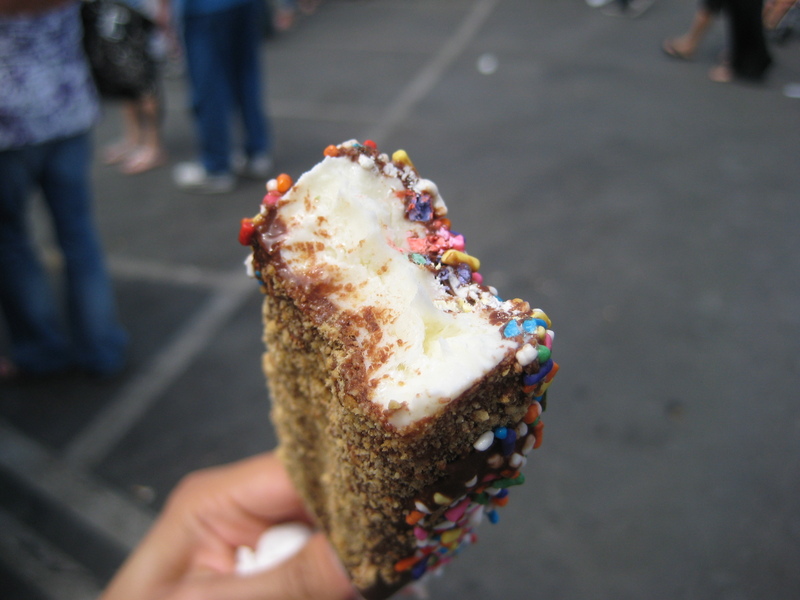 The center was still beautifully fresh and melted on my tongue. 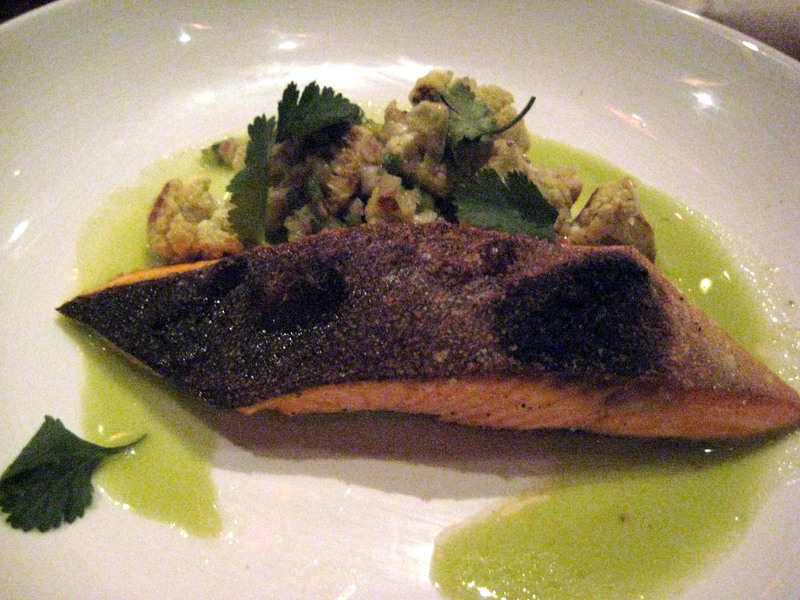 The Artic Char with with Jalapeno Cauliflower was pan-seared so the outer skin was crisped up and then roasted. The skin did get charred a little too much but it did not effect the fish itself thankfully. The char was tender and delicious. The jalapeno cauliflower was so good that I could eat a bowl of it on its own! 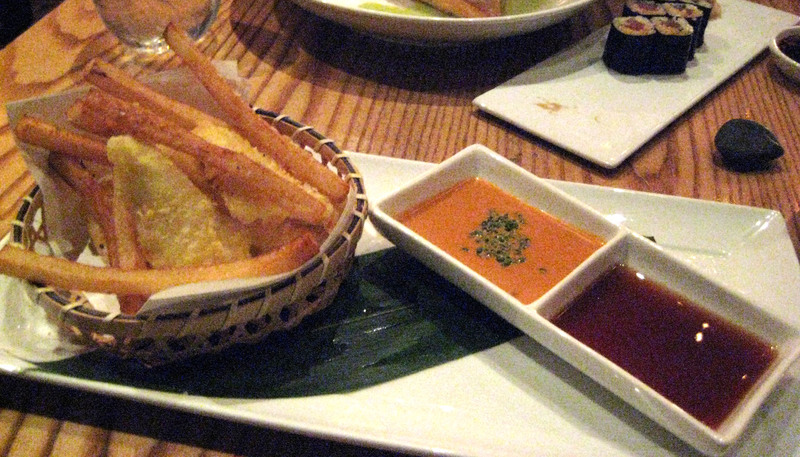 Nobu’s take on Fish n’ Chips made me want to eat more fish…mostly because they used Chilean sea bass. I want to talk to whoever came up with this idea of battering and deep frying sea bass! Granted, it was delicious with a slightly thicker tempura batter, but why would you deep fry a beautiful fish like sea bass?! 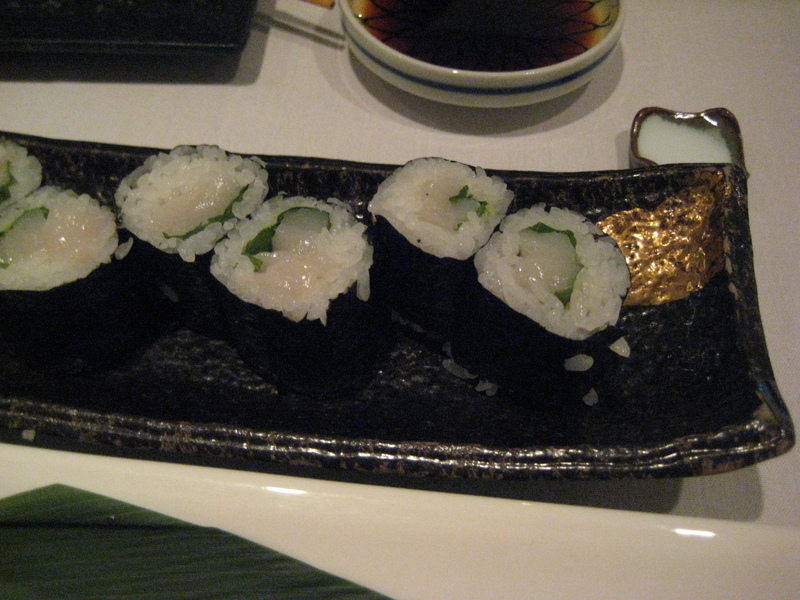 I love sea bass…like it is my TOP fish choice and I would never, EVER think of deep frying it. 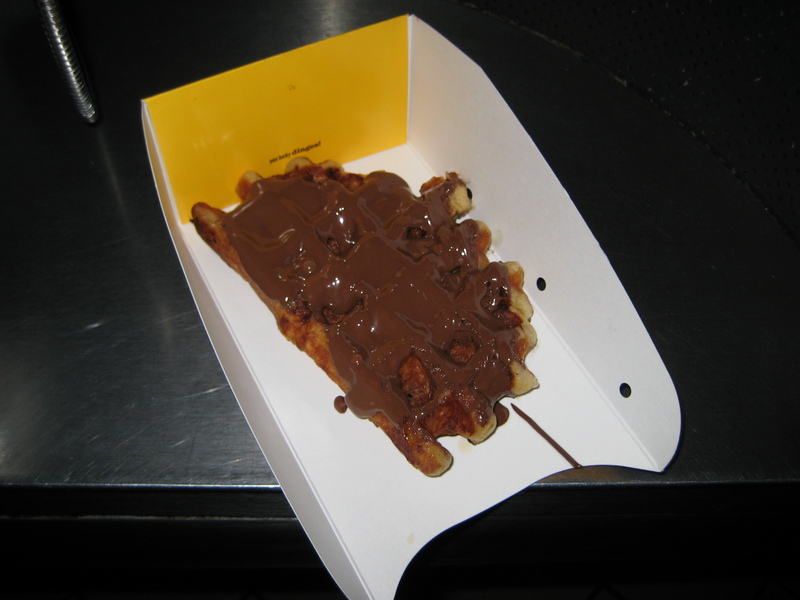 It feels just wrong…but yet…it did taste oh so heavenly…I was torn! The chips were a little limpy and sad, but that honey anti-cucho sauce was so good that I just wanted to dip everything in it! 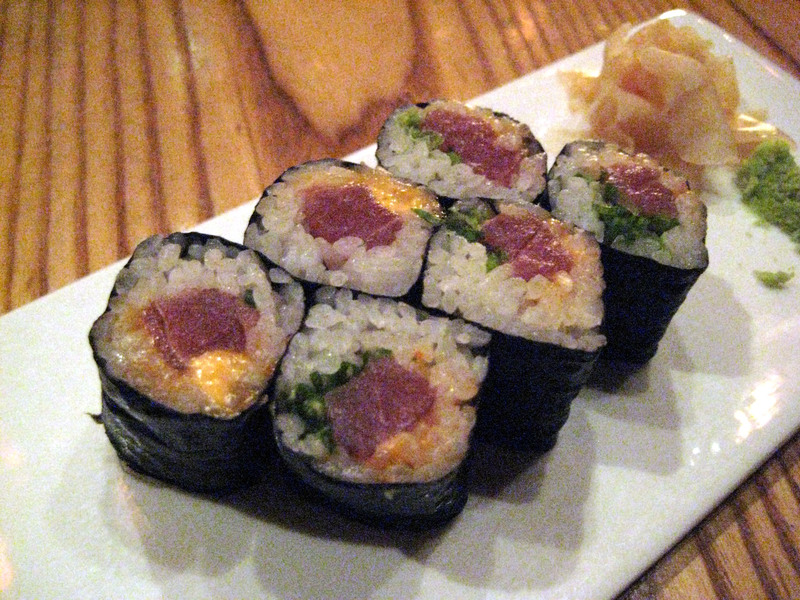 Each entree came with a Spicy Tuna roll. My only grip about this was that the menu promised me spicy yellowtail (which is my favorite fish for sushi), but instead tuna came. I love tuna and everything, but my hopes were up and then shot back down. Another night, another meal! CP’s chopped house salad really was chopped and tossed! 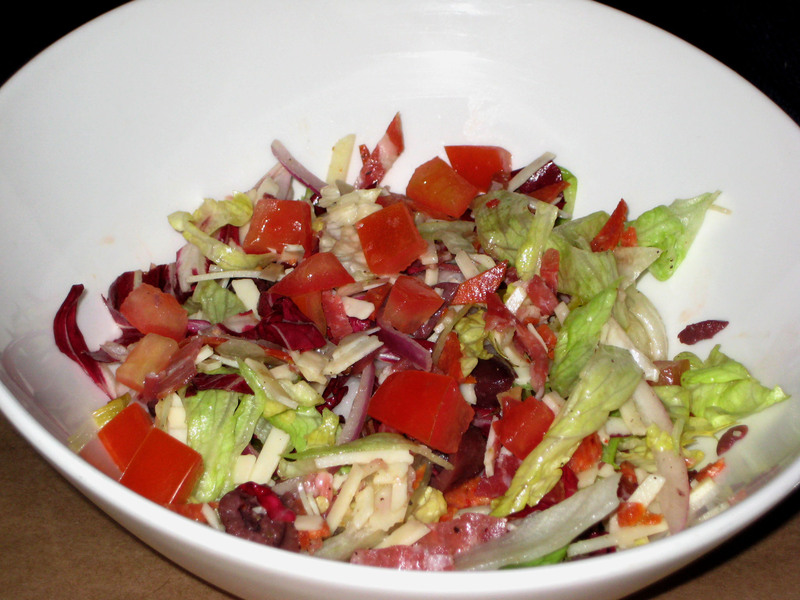 It was medley of soppresata (salami), pepperoni, olive, red onion, tomato, asiago, pepperoncini, and some lettuce. Not sure if I’d really would call this a “salad” in my terms, but it was delicious bowl of chopped meats and vegetables (mostly the former). It was all tossed in a vinaigrette that was sweet but had a little bit to it too. 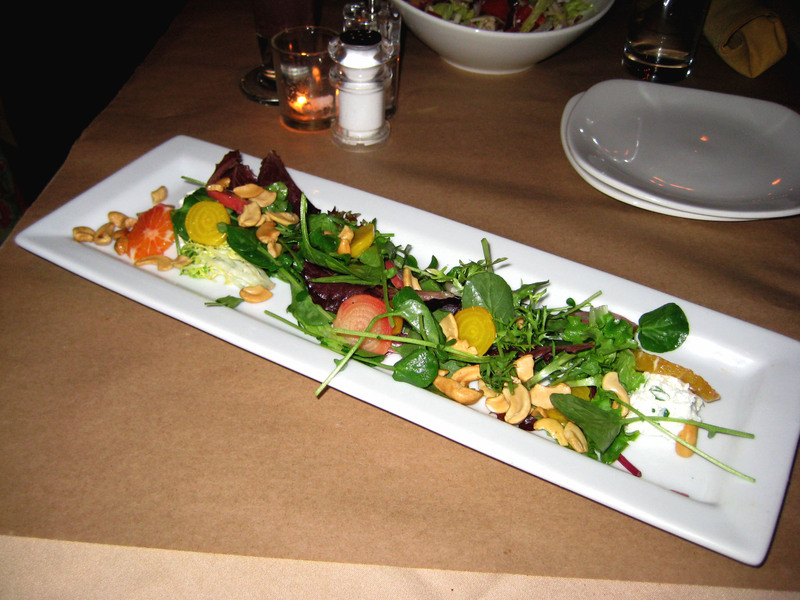 My first course choice was the roasted baby beet and orange salad was divine! Light, summery salad with lots of color and it was simply fun and smart. The baby beets were tender and delicious with the cashews. 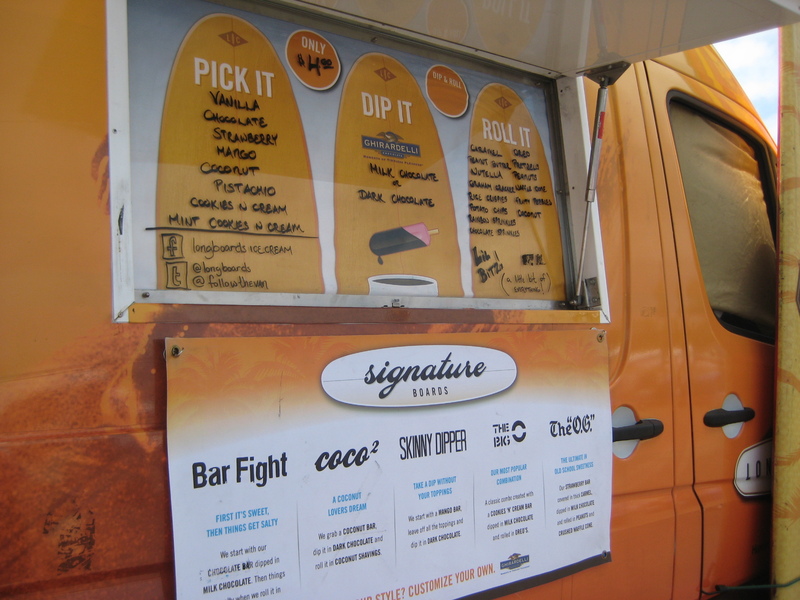 I think my favorite part were the scoops of ‘yo-goat’…or basically, goat’s milk yogurt. Goat cheese is my absolute favorite cheese in the whole, wide world! However, I’ve never had goat’s milk yogurt! Just imagine goat cheese…but SOFTER! HEAVEN!!! We went with the pizza pre-fix menu so CP went to where his Italian heart will always be: a red pie with pepperoni and fennel sausage. 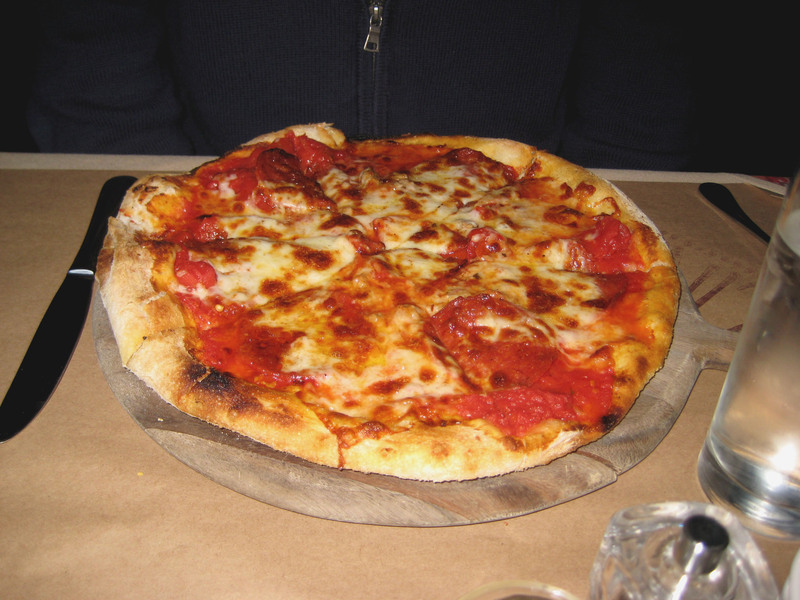 The nice charred underskirt of the baked dough held the sweet red sauce, with house-made mozzarella and the meat. 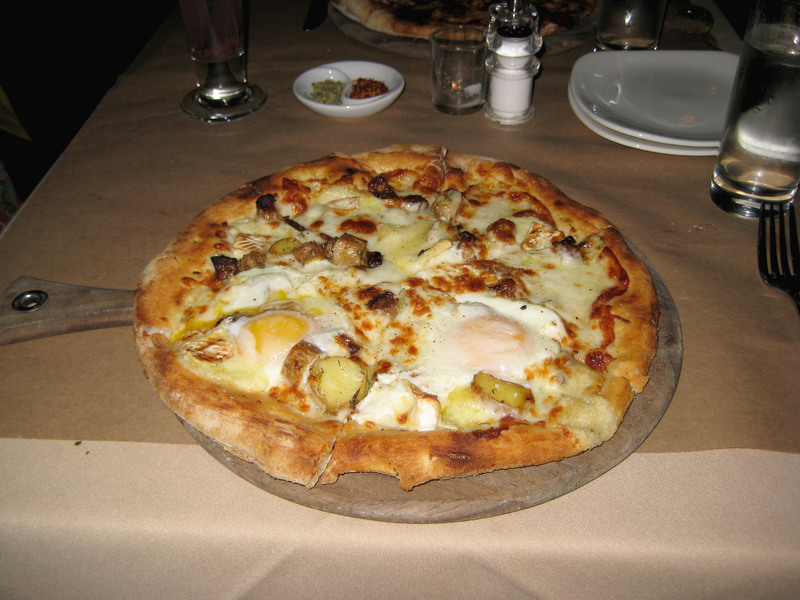 CP gave 2 thumbs up to the wood fire oven pizza and proceeded to consume the whole thing. 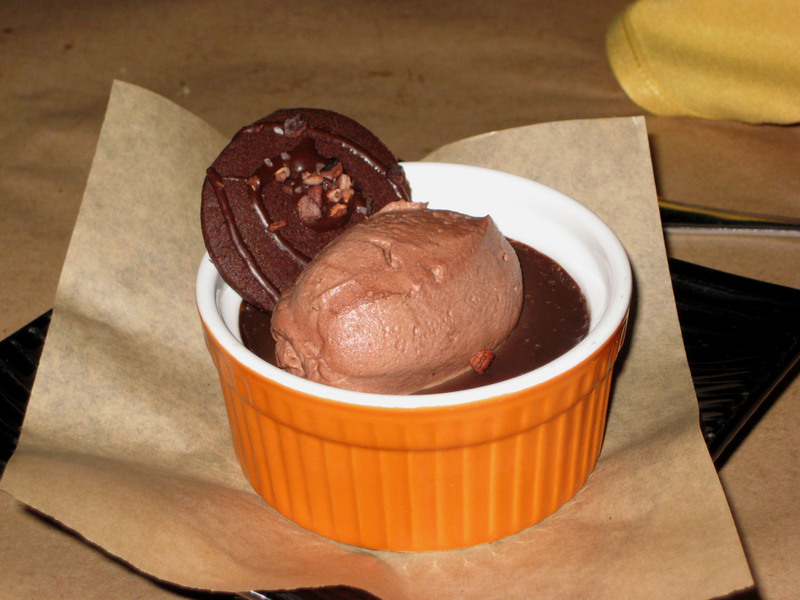 The chocolate budino with chocolate chantilly and salted chocolate biscuit….CHOCOLATE ORGASMIC PSYCHEDELIC EXTRAVAGANZA! “Wow” would be an understatement. 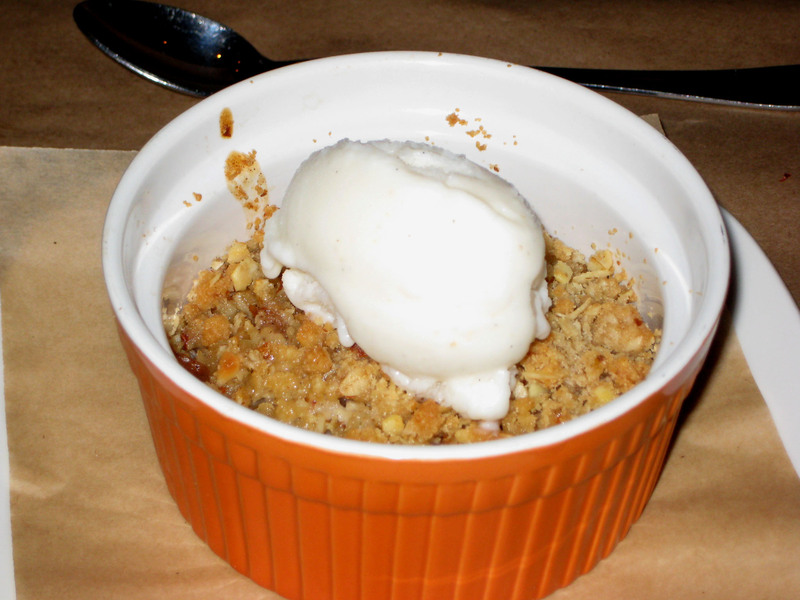 Let me help put this in context….I had already had 2 full courses which did include a sizable pizza…and the fact that I could still taste and have my mind be blown away by this budino….yes, it was just that good! Budino is Italian for pudding and that’s just what it was: a dark chocolate pudding. Thick and unadulterated chocolate pudding that was intense in flavor. Perfectly balanced, just sweet enough, but still a dark chocolate pudding. The chantilly helped lightened up a bite if you were (like me) already feeling like you’re at your breaking point in your stomach. 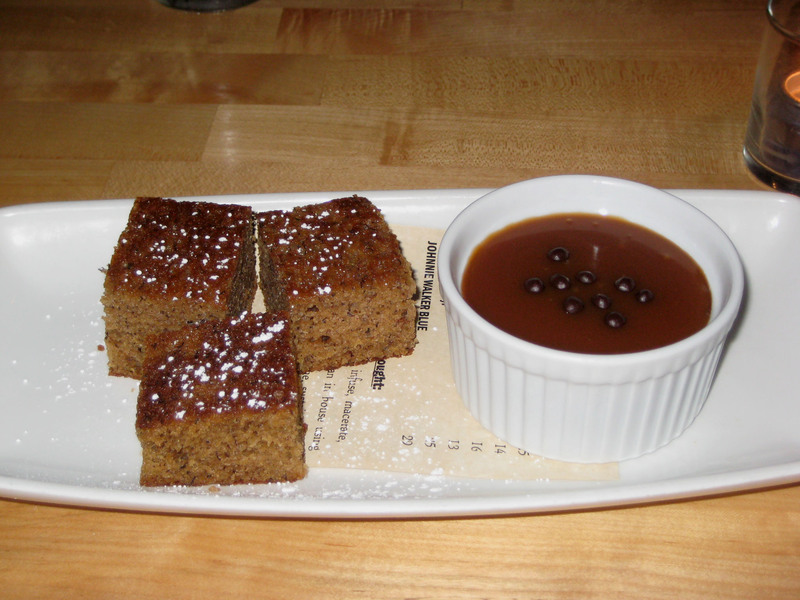 The salted chocolate cookie was good, but I found myself not wanting it because it got in my way of the budino. 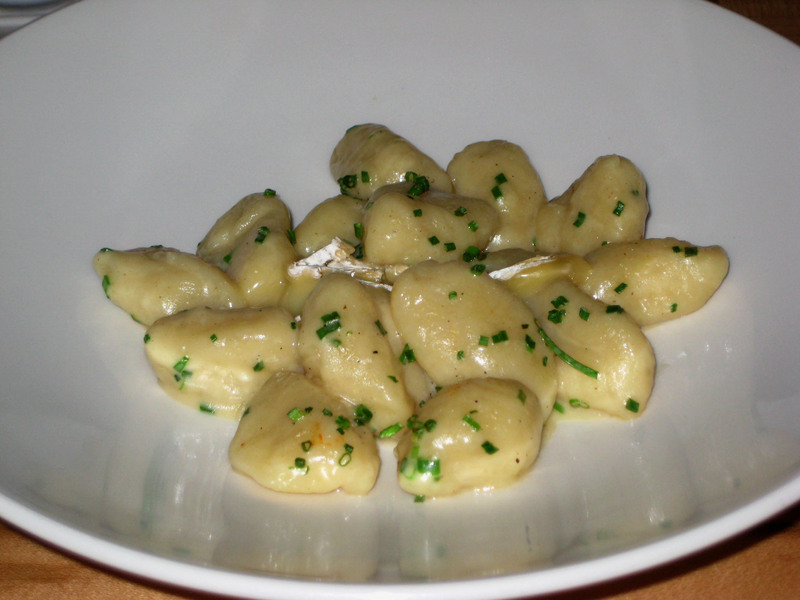 I love Cucina Urbana for it’s rustic, no frills, yet still very much stylish atmosphere. 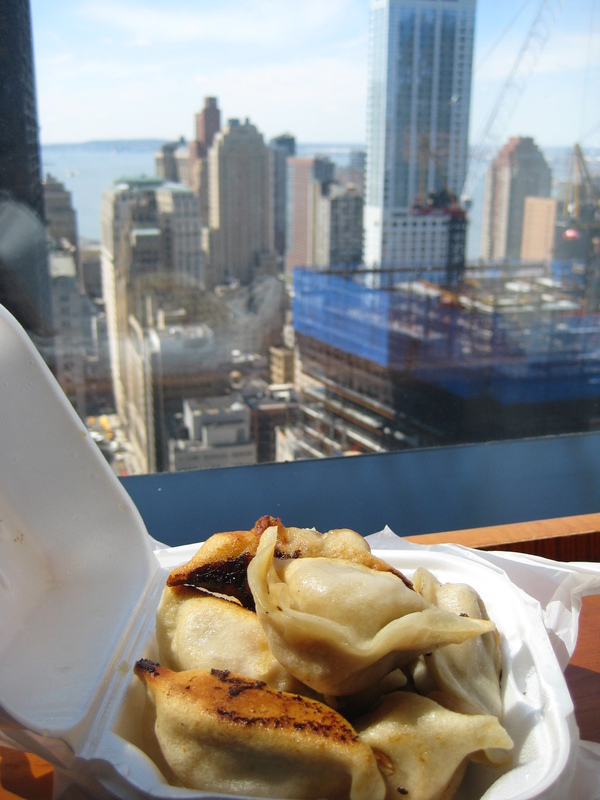 They present food as it is and let’s the food’s own brilliance shine through. All the chef does is perhaps polish it up and gives its a nice pep talk before it makes its debut on your table. Wonderful experience. I must say that this year’s RW did not fail to impress me. The number of restaurants now participating in this event has seem to grow with each passing year. This shows that restaurants now understand the power of this well sponsored and advertised event is to their advantage. I have also noticed that a lot of restaurants continue to promote the pre-fixed menus (yay!) 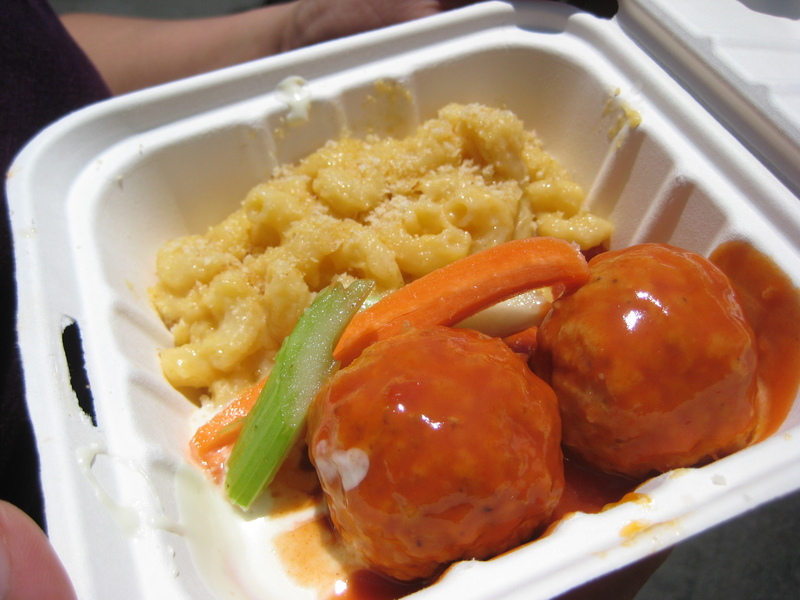 for both the cost-conscious consumers and encourages regulars to try something new at their old haunt. A good addition to a restaurant’s recipe for a long life in a world where only the best of best can shine through the decades. Once again, I find myself up in the air wanting nothing more than to come home and nurse my misery of allergies (or maybe I really was just sick). The past week, I was in North Kansas City for work and I guess there’s really “no place like home”. That right there is a total of 3/4 lbs of delicious, smoked, tender, practically illegal how meats. I had 1/4 lb each of (left to right): pulled pork, turkey, and sausage, with a side of baked beans. My gawd I was in heaven! 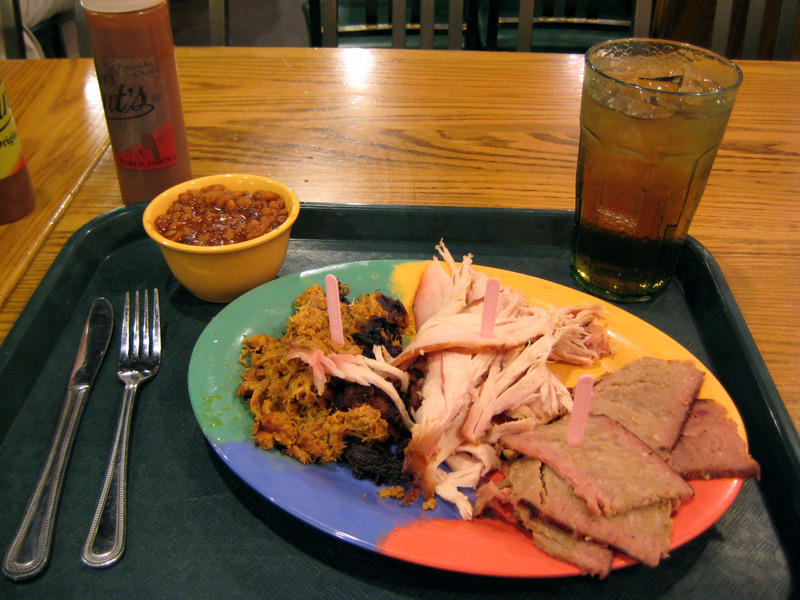 Granted, I love Phil’s BBQ in San Diego for the reason that they make a good pull pork sandwich…in San Diego! Pull pork can taste very differently depending on its maker. And the maker here knows his oinker. The sausage was not my favorite of the 3 since my memories of the smoked sausage I had in Oklahoma City was still fresh in my mind. 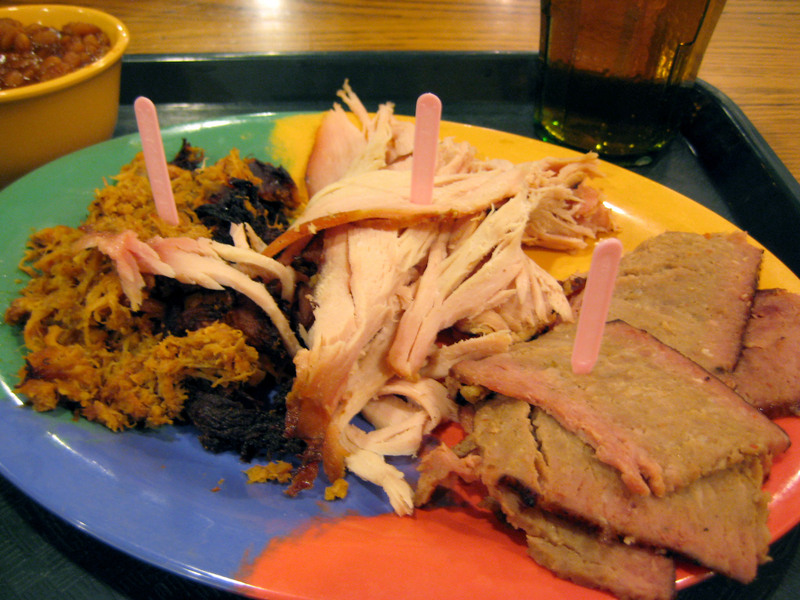 The turkey was good too, could have been a little more moist but this time…the sauce really did the trick. As you will find (while reading on), the Arthur Bryant spicy BBQ sauce was absolutely DELICIOUS. Omg…never had I wanted more and more of BBQ sauce. I wanted to have the sauce straight up and drink straight out of the bottle. However, since I was with other people and in public…my better judgment took over (thank goodness). Instead I washed it all down with some refreshing sweet tea. After our first day at work, we were all in need of a good meal (lunches are usually a pretty excuse of a meal most of the time). During the entire day, whenever I had a client meeting, I would also end by asking for suggestions for dinner. I had my handful of suggestions and in order to avoid BBQ fatigue, I took a highly recommended local Italian restaurant suggestion. 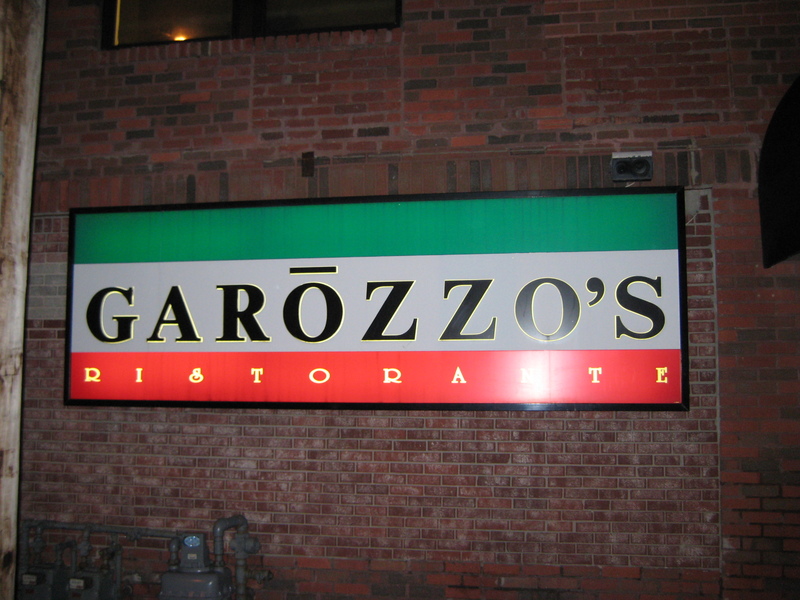 The location of the Garazzo’s that we went to was nestled into a neighborhood and we were wondering if we were going to someone’s grandmother’s house to eat. That would actually be quite interesting and fun, but nope, we finally found the restaurant. There must have been several parties that night because it was a Monday night, at 8:30pm and the place was still packed. However, I had made reservations and so we were seated in no time. However, we were all starving even before we were seated so thank goodness one of us took the initiative to order us an appetizer to start off. 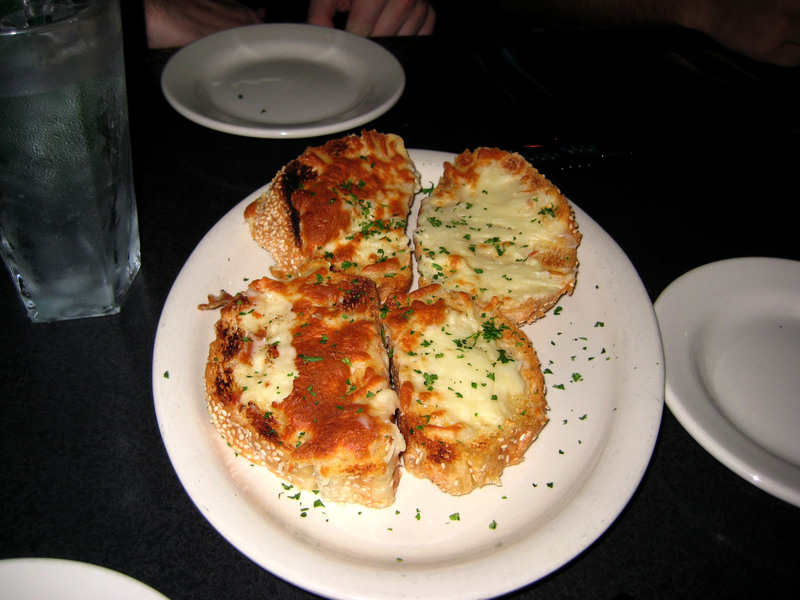 The garlic bread with cheese was made sliced crusty bread, with melted parmesan, sprinkled with basil. The bread that they used was a little too soft and would have done better with a French loaf, sliced open and then divided into smaller portions. It was still good, but it was nothing exciting. Now this was a true spectacle. This monstrosity was not meant for 1 person to go up against on her own without any backup. 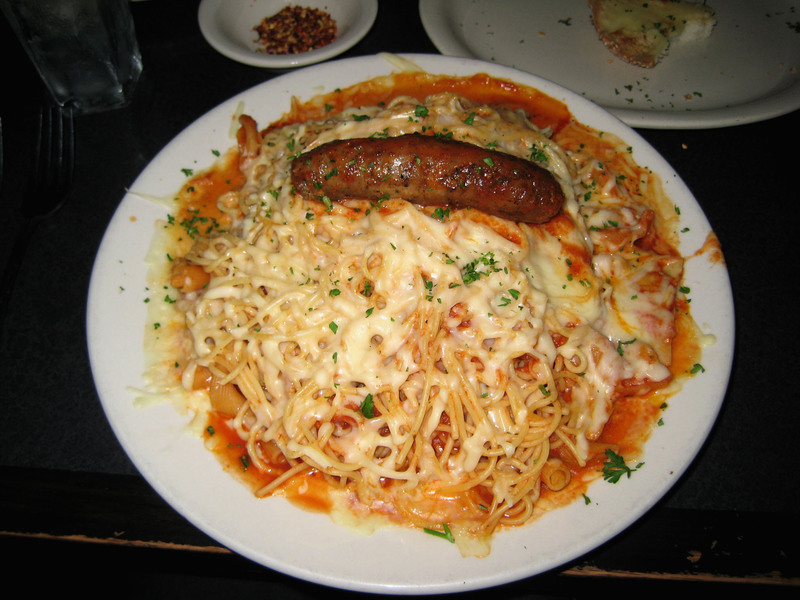 Ladies and Gents, this is Garazzo’s “Three Way Pasta”. On a plate that was the size of a steering wheel, we have: tomato sauce, spaghetti, rigatoni, meat ravioli, topped with parmesan cheese and Italian sausage. The plate could have easily weighed about 3 lbs. I barely even scratched the surface of this mountain of carbs before I threw in the towel. When I stopped eating, it didn’t even look like I had any of it! How did it taste? It was fine. 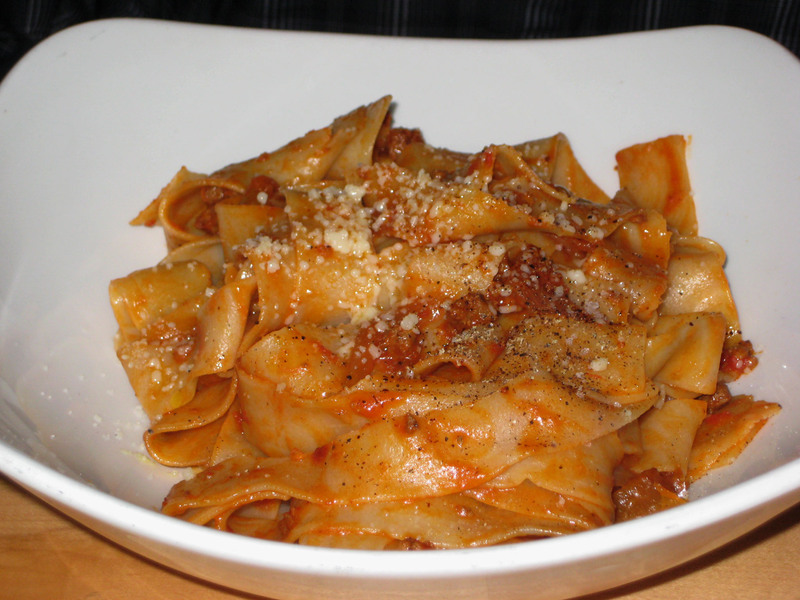 The pasta was cooked well, the sauce was a little bland and weak, and the Italian sausage left me wanting more. This was one matter of quantity versus quality. Our eating and gorging didn’t stop even after our way too filling Italian food from the night before. (This is mostly due to fair, to sub-par lunches.) 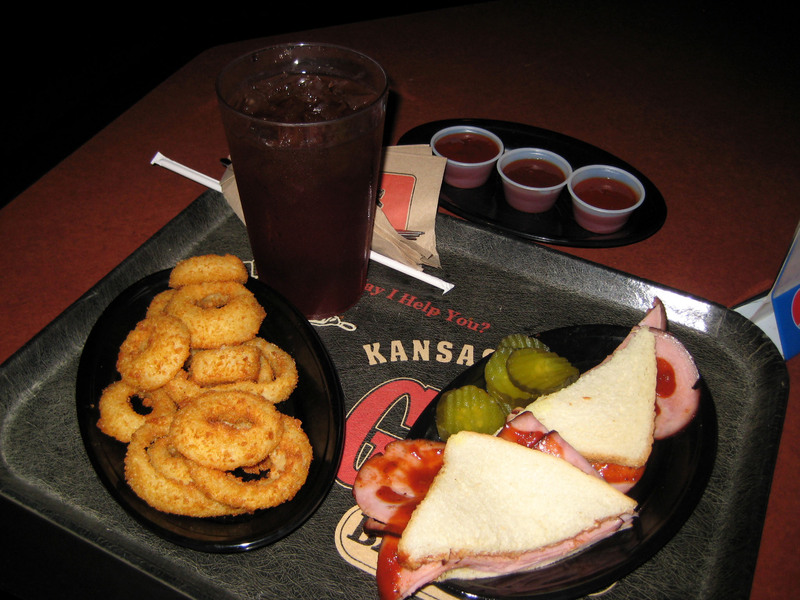 The clients told us that when you’re in Kansas City, the all time question when it comes down to barbeque: Arthur Bryant’s or Gates. How could I not take up this challenge and find my answer?! 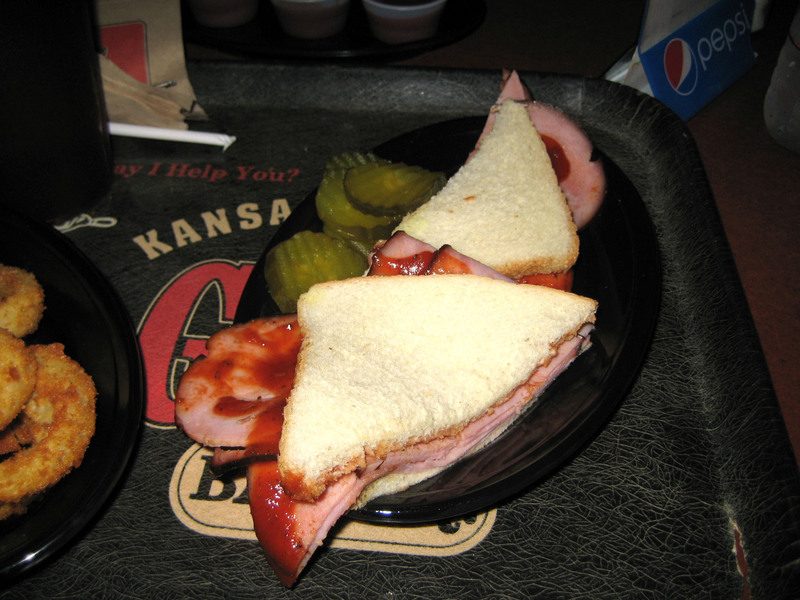 The sandwich was simply 2 slices of Wonder bread with thinly sliced ham and the original sauce. Normally I don’t like flimsy sandwiches. I prefer toasted bread or crusty bread, but c’mon! I’m eating bbq and there’s no place for such things! The ham was so delicious that it made angry. Angry that was subjected to mass produced, packaged deli meats that tasted like the meat (if it really was meat) cured in chemicals. This was a simple ham sandwich and it had me giddy! As for the answer to the question: who does a better Q? Arthur Bryant’s or Gates? It was a hard call since I had different types of meats. However, I can definitely say that I preferred Arthur’s BBQ sauce more than I liked Gates. So that’s one point more for Arthur than Gates, but I would jump to eat at either one of these establishments anytime. Ugh…now just thinking about this place makes me angry. Never had a seen a sadder meal than this one. 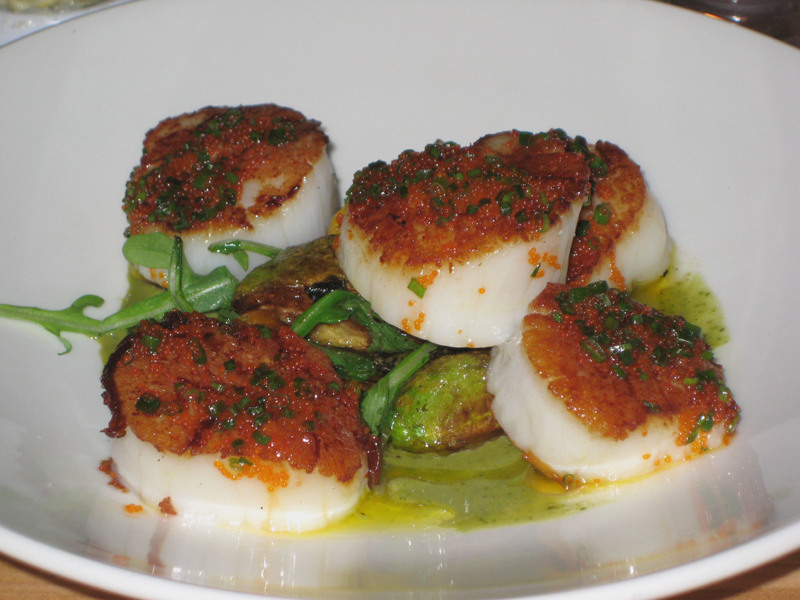 Scallops are one of my FAVORITE shellfish to eat. This place practically killed it for me. Just seeing this picture, thinking back on it, made my head pound in pain and misery. 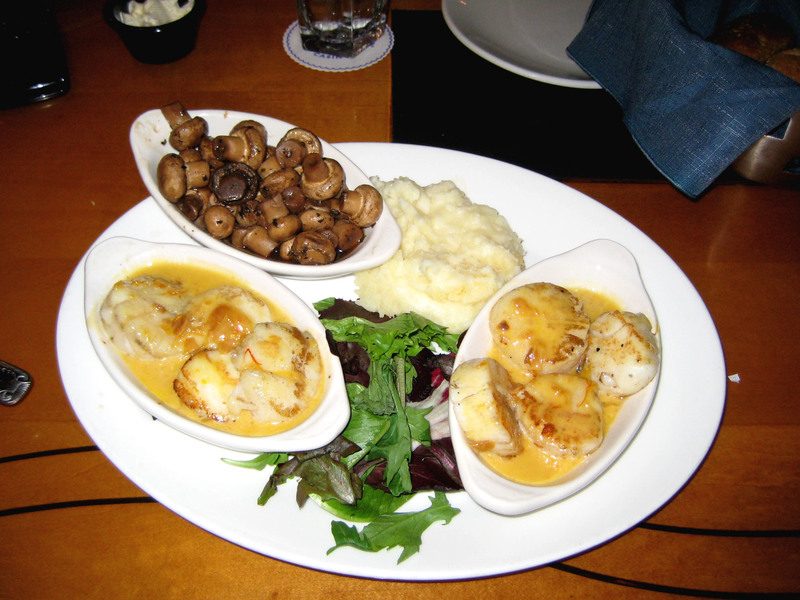 These babies may not have been the freshest scallops, but the poor attempt to hide it made it even WORSE. See that orange pool? It was some sort of a butter bath for a poorly seared scallops. :(…*to the scallops* it’s ok…it wasn’t YOUR fault. Best thing on the plO_Oate?…the mushrooms and the water (you can’t see it in the picture). 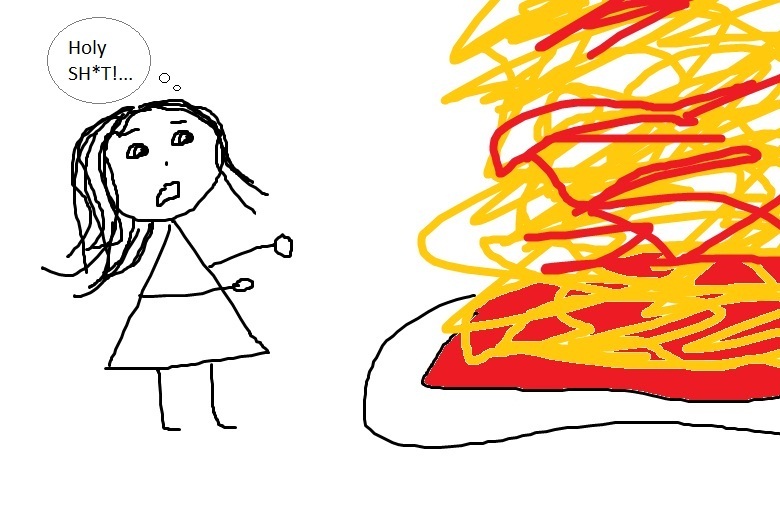 After that horrendous meal, I was a bitter person. I was in a bad mood not only from the course of the day, through many factors plus a terrible meal, I needed something to change it all around. Thank GAWD there was a savior! One of the guys had gotten a recommendation to this place from the person next to him on the plane. We all needed a break from the “regular” and this was perfect! The restaurant was elegant and beautiful. It was started with nice fresh bread and crisps with 3 dipping sides. 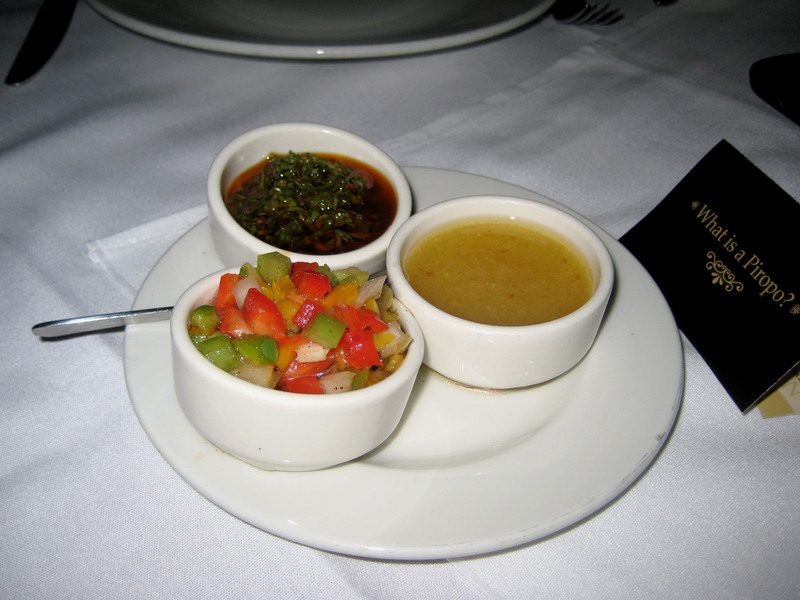 Clockwise from the bottom left: multi-colored peppers and onions in oil, vinegar; chimichuri; and garlic dip. My favorite of the 3 had to be the peppers and then the chimicurri. This was a very good start! I was at an Argentinian restaurant so how could I leave without trying an empanada?! 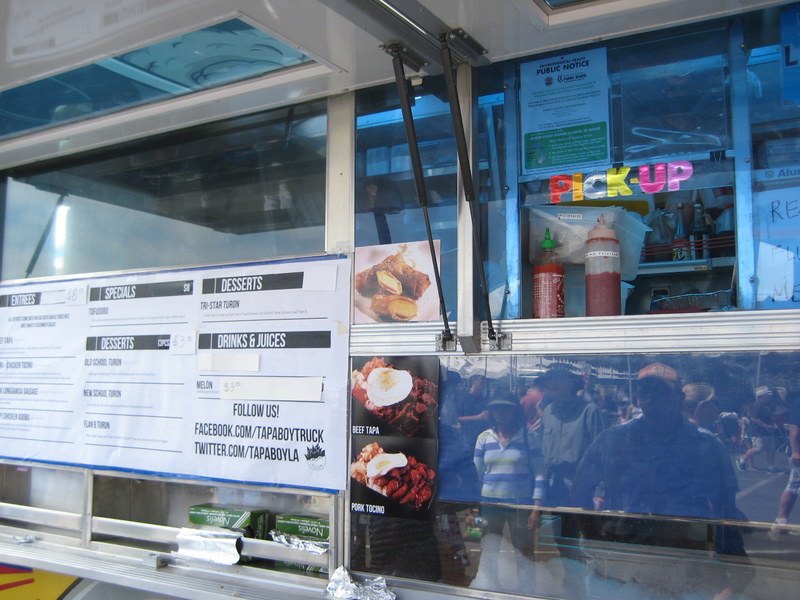 I had the Empanada del Mar, which was filled with shrimp, scallops and tilapia, with red peppers and onions. The filling was fresh and it all worked with one another. It was a small tasting of the ocean on my plate. My only criticism was the wrapper they used. It didn’t give me the flaky pastry that I have come to expect for empanadas. 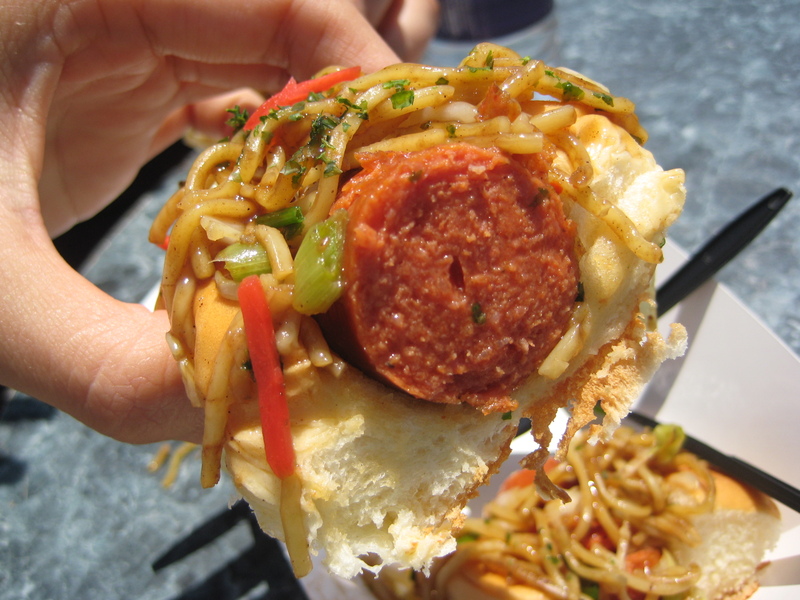 This was more of a wonton/eggroll wrapper that was deep fried. Trust me, flaky (in a pastry) = goooood eating. As I had no desire for anymore seafood or pasta at the moment, and I didn’t have the stomach for lamb that evening, I went with the chicken. Thank goodness their chicken entrees were just as appealing and this one sounded just scrumptious! 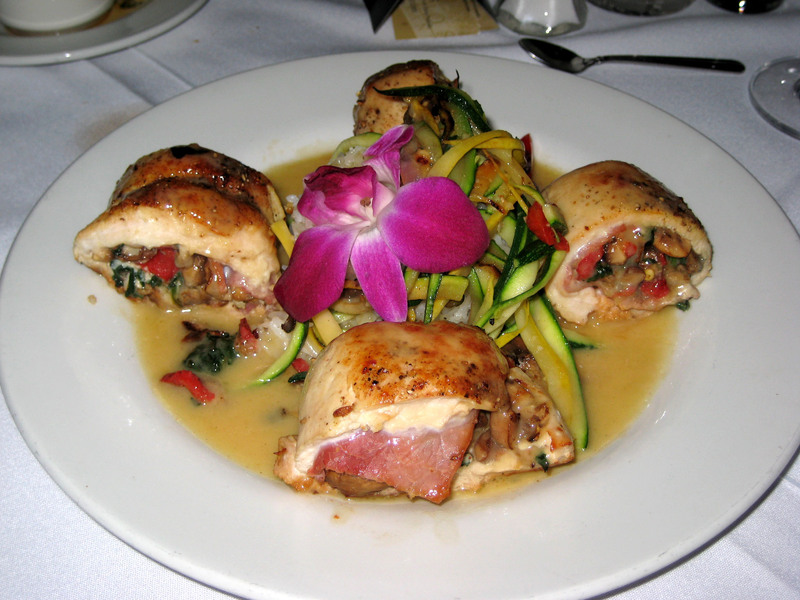 Ruedas de Pollo: this was stuffed chicken breast with gouda, ham, spinach, mushrooms, and red peppers. 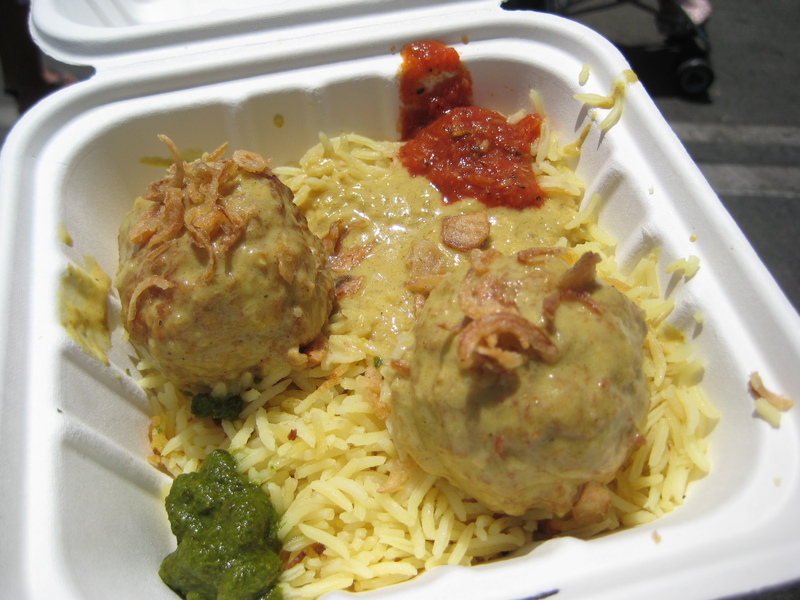 Served with these rolled chicken of yum, were julienned veggies and rice, all in “argentine” garlic sauce. My goodness, that sauce was ridiculous. 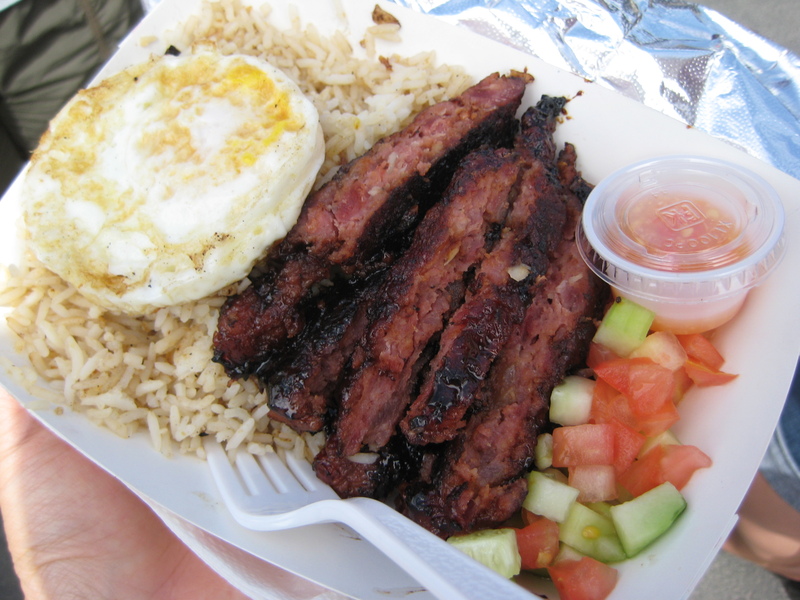 The flavors were so intense that all I wanted was more of the sauce (even though there was a heavy hand in butter) and rice! 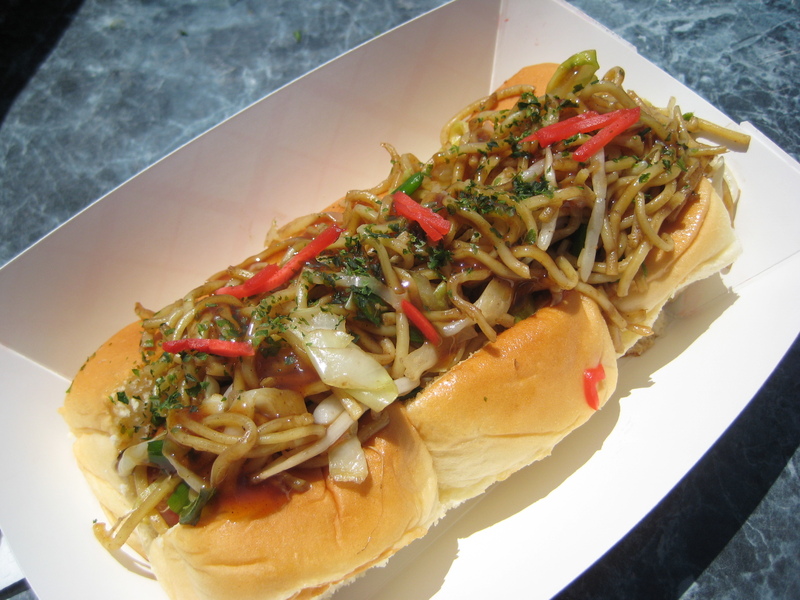 Mmm…so good. The stuffing for the chicken was great, but the chicken was a little dried out. However, given how good all the other components were, I could over look the dried chicken. By this time, I was thoroughly content with everything I had so far. However, during the entire meal, I had watch waiters walk by carrying a cake and I knew there was no way I would walk away without it. 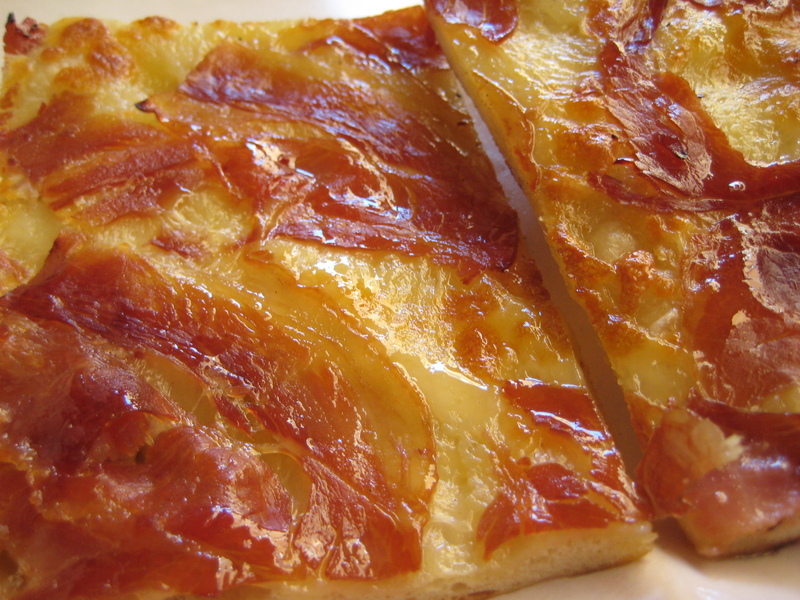 This my friendly blog reader, is the Pastel de Banana. A luscious banana cake with a whipped cream cheese frosting, in a pool of crème anglaise, and just because I had to go all out: a special request of a scoop of the vanilla bean ice cream. The cake was truly a banana lover’s delight because it was packed full of banana flavors. You could see the specks of the banana that was mashed in order to make this cake possible. The cake was light and moist, which was not the case with the frosting. Granted, it was a good whipped cream cheese frosting, but it made the dessert overall too dense. 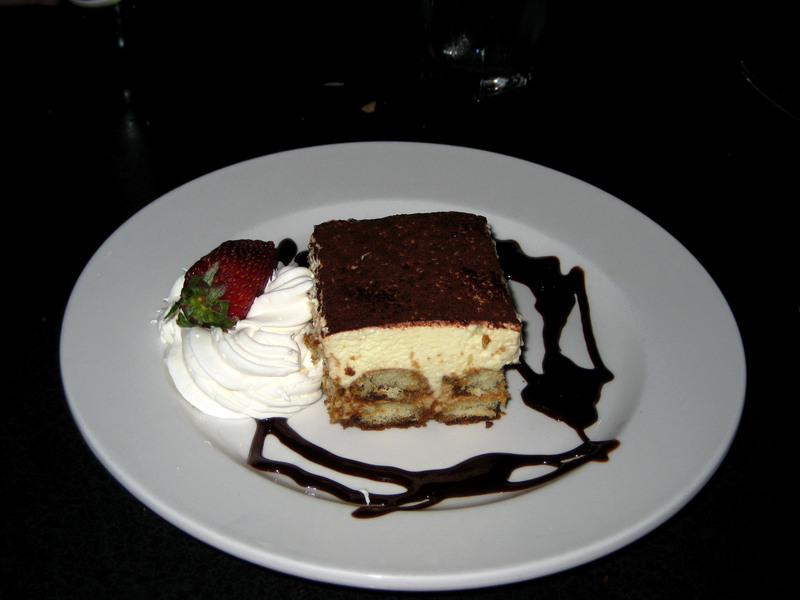 This could be the dessert for someone, but I had my likes and dislikes. 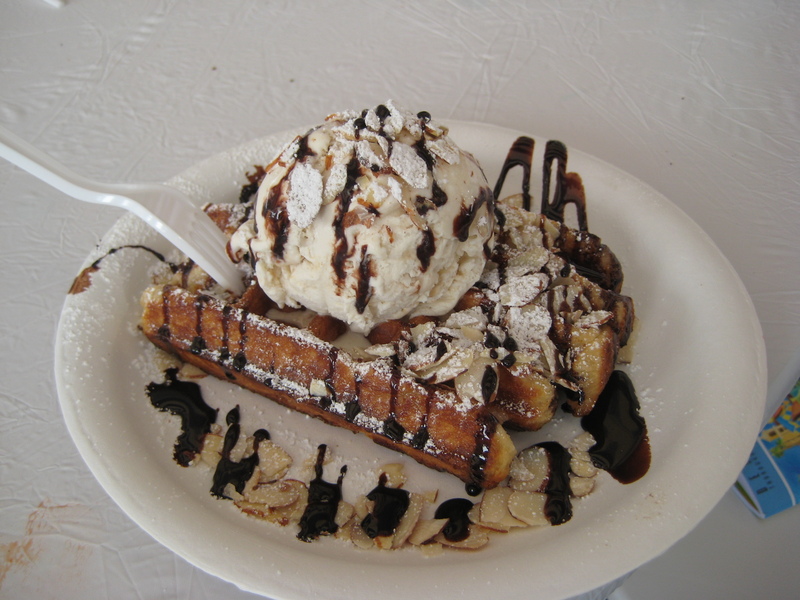 The ice cream though was great and it really did help lighten the plate. I really wanted ice cream so I asked our waitress nicely if I could get a scoop even though the dessert did not normally have it. So I ended the night on a wonderful note! Thank you anonymous flight passenger who gave the suggestion!